Some of the games I’ve played over the years really stand out in my memory. From time to time I’ll feature these old games here on my blog. 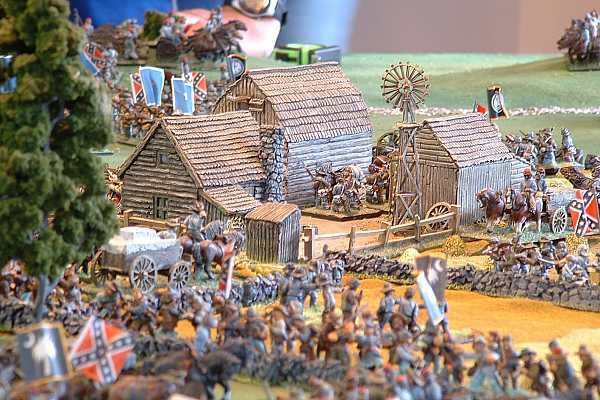 This particular game stood out because of the amazing terrain and figures. To my eye, this was a convention-grade game, but played in a garage! I never recorded the date this game as played, but it would be a good decade or two ago now. This game impressed me so much at the time that I even put together a website about it, from which I’ve copied the following text and pictures. Much to my surprise, the site still exists – thought my amateur hand-coded HTML doesn’t seem to have preserved the formatting too well. The year is 1777 – General “Gentleman Johnny” Burgoyne’s expedition to cut off New England from the rest of the rebellious American states has reached the clearing of Freeman’s Farm. 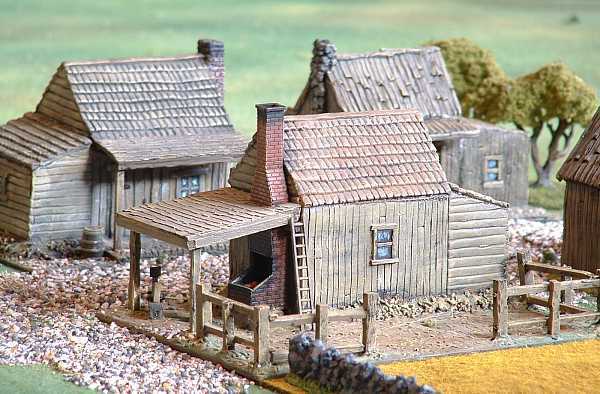 The lines of redcoats form up around the farmstead, whilst a redoubt has been rapidly thrown up on their right. They steadfastly await the Americans advancing from out of the woods in front of them. 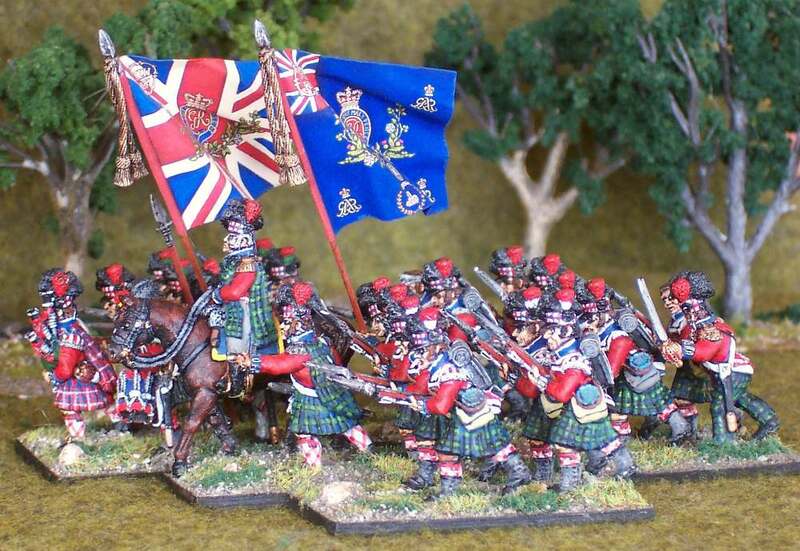 Myself and two other New Zealand wargamers, Paul Crouch and Steve Sands, had recently bought a copy of the British Grenadier rules, and we were determined to try them out. One Sunday afternoon the three of us finally managed to get some time off together, and this is the game that ensued. British lines around Freeman’s Farm. 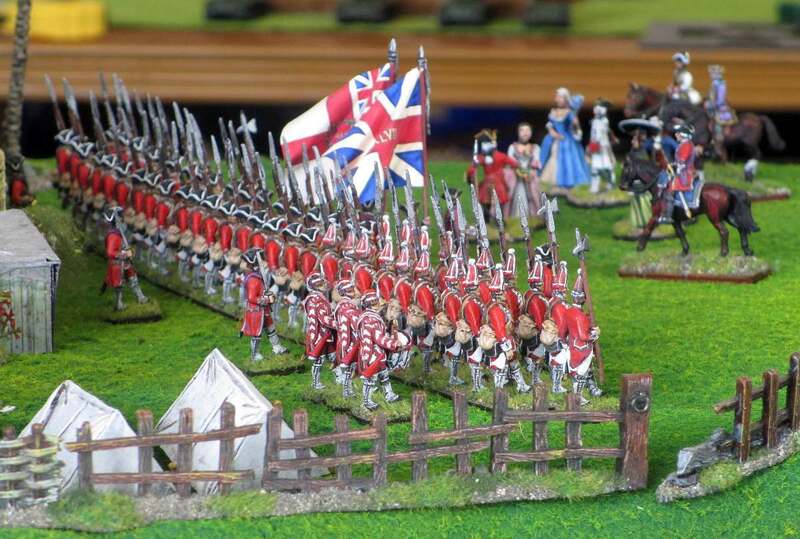 This closer view of British redcoats from General James Inglis Hamilton’s brigade around the farmstead shows some of the amazingly detailed 28mm miniature soldiers and terrain owned by Paul. 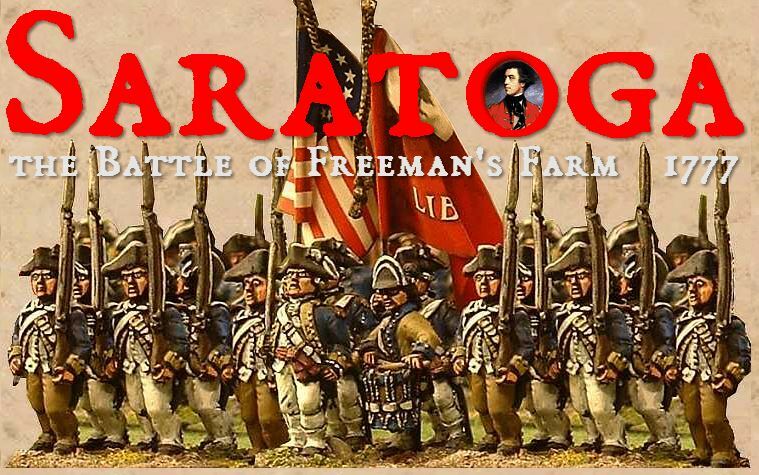 The scenario rules for this battle state that the troops of Brigadier-General Simon Fraser’s brigade can only leave the confines of their redoubt on the British right after a throw of double sixes. “I never get double sixes,” says Steve, throwing the very first dice of the game – you guessed it, double six! So Fraser’s light infantry and an artillery piece emerge from the redoubt in the first move of the game, throwing the American plan into disarray before they even start moving. Poor’s columns advance down the road towards the waiting British. On the American side, Roly commands General Enoch Poor’s brigade of infantry and artillery. The scenario calls for them to enter by a road on the left of the American position. But instead of heading diagonally towards the British (visible in the distance in this photo), the threat of Fraser’s troops making their sortie out of the redoubt means that the Americans have to change their orders to make a right turn and form their lines more to the centre. The American advance in the centre. Poor’s brigade has now been joined by that of General Ebenezer Learned, played by Paul. Meanwhile, General Benedict Arnold and his aide can be seen in this photo, directing the commencement of the assault on the British line. Unfortunately, another double six means that Arnold is lightly wounded, and so has to temporarily leave the table. You can also see the amazingly realistic ground-cloth that Paul inherited from the late Jim Shaw. Thrown over a piece of carpet underlay, which in turn is draped over strategically placed objects, it gives a realistic rolling ground effect. The British line awaits the onslaught. 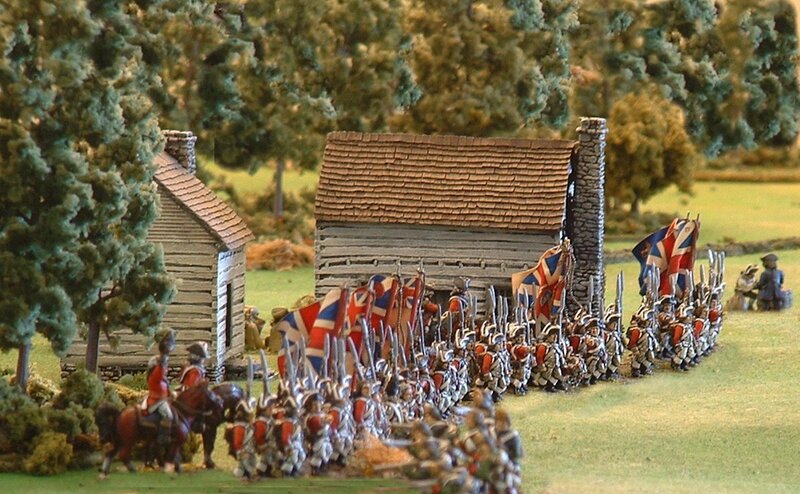 After moving their line back slightly to form a better defensive position around the farm, the British lines stolidly await the American attack, with some loyalists skirmishing to their front. 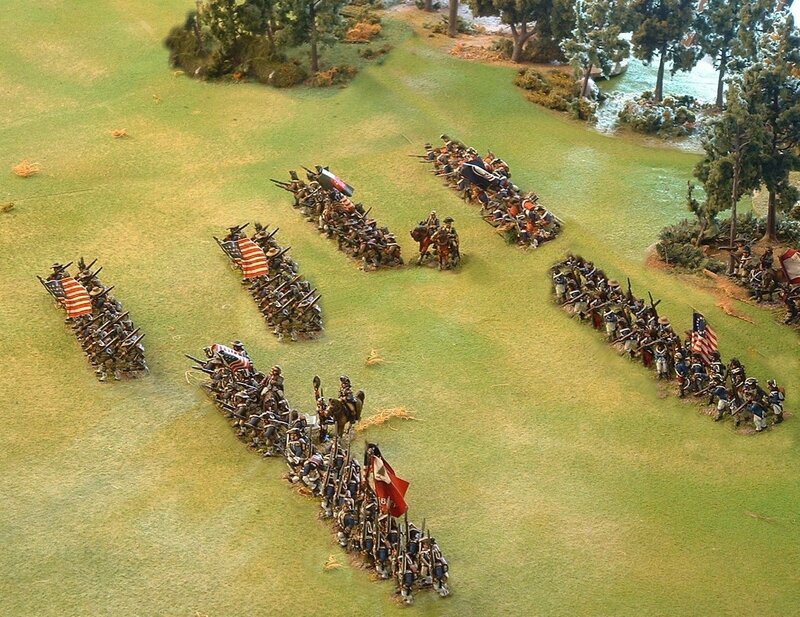 The redcoats’ objective in this scenario is to hold the farm position. All the figures used in this game belonged to Paul. 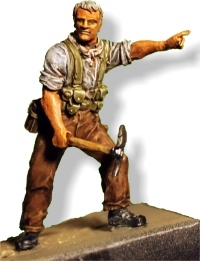 They included castings from Front Rank, Foundry and Perry Miniatures. The exquisite flags were mainly by GMB Design. 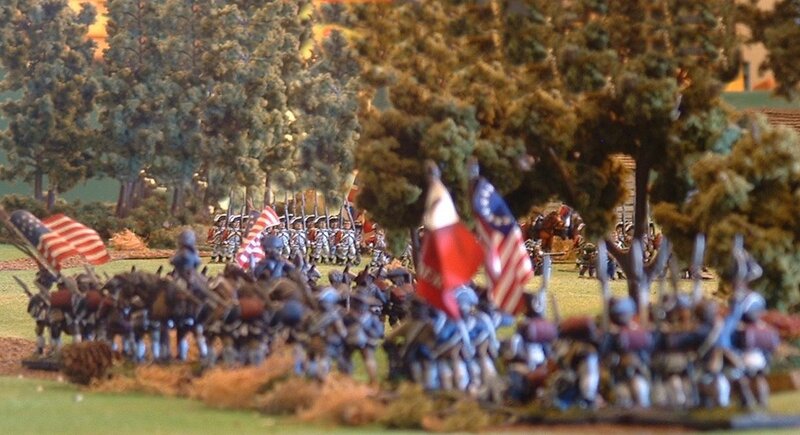 Slowly, inexorably, the American lines advance towards the British. 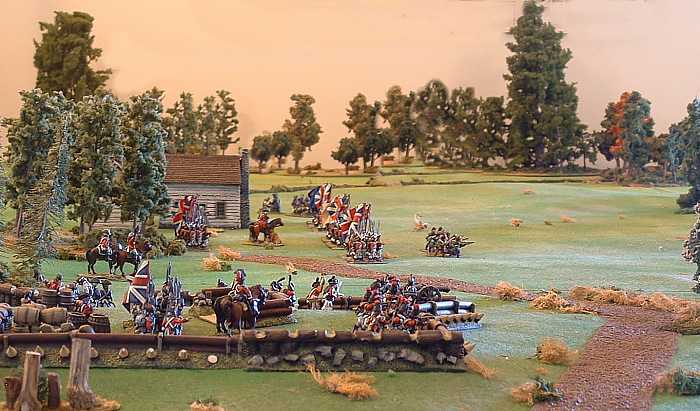 Because of the extended maneuvering that Poor’s brigade has had to do to avoid Fraser’s light infantry and artillery, it takes quite a while to reach this stage of the game, so we “fast-forward” at this point by doubling a few moves to bring the troops into action. Movement distances in British Grenadier are randomised, and generally must be taken the full amount. This makes coordinating an attack quite difficult, but true to the period. Finally the first regiments of the assault charge forward. The mounted officer in the background is not just for show. These rules have an innovative system where units earn ‘disruption points’ from movement, firing and melee. The more such points, the harder it is to do anything. Generals can help units shake off these points, but only one unit per move, so they have to pick and choose. 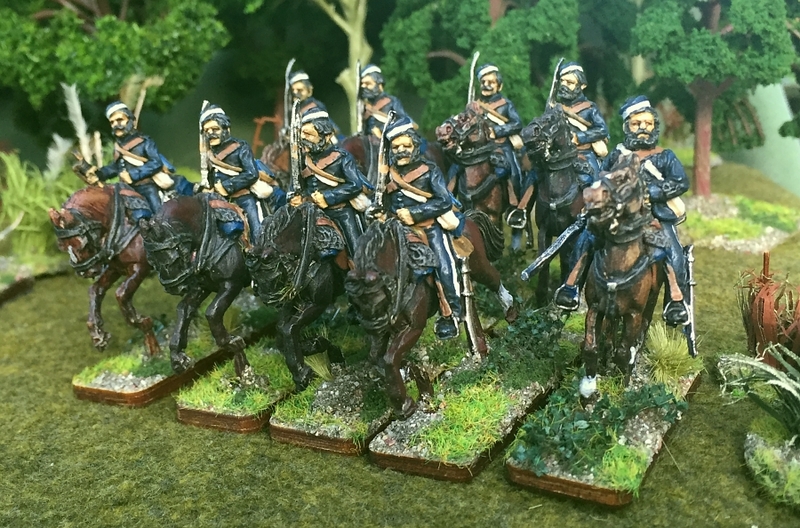 Thus mounted officers realistically gallop to and fro all over the battlefield. The second American line in support. American troops in hunting shirts form the second line. Under these rules, an attack needs to be well supported, as the disruption points can cause havoc to the first line. On the other hand, you don’t want the second line too close, as they have to move their full distance, so can actually collide with the rear of the first line, causing even more disruption! 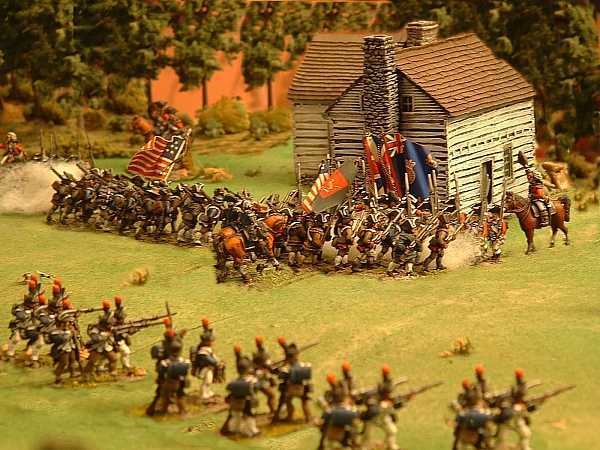 The American regiment on the far left has defeated a British battalion and forced it back. But the British battalion on the right holds out valiantly, whilst General Burgoyne dashes up to bolster its defence. Here yet another double six is thrown, but Burgoyne survives and it is his ADC who is killed. 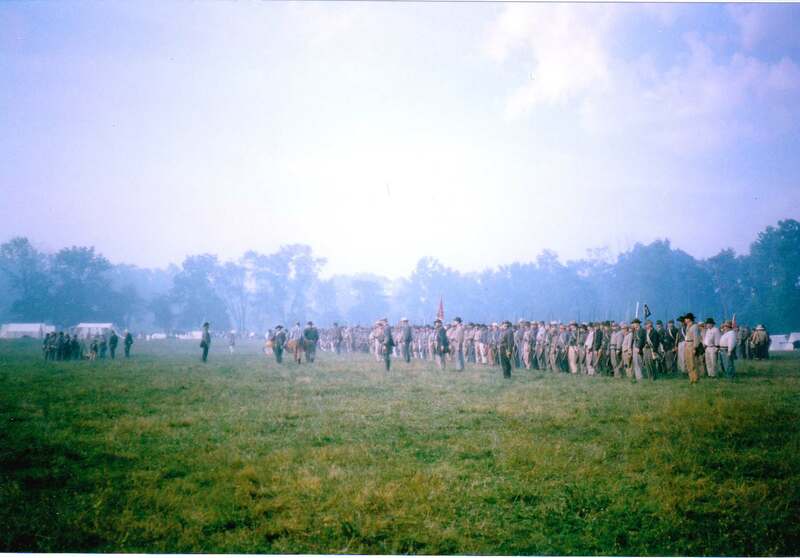 In the foreground are Colonel Daniel Morgan’s riflemen and light infantry, who have been in front needling the British lines all during the big American assault. Now they can pull back out of the way to let the line infantry do their job. 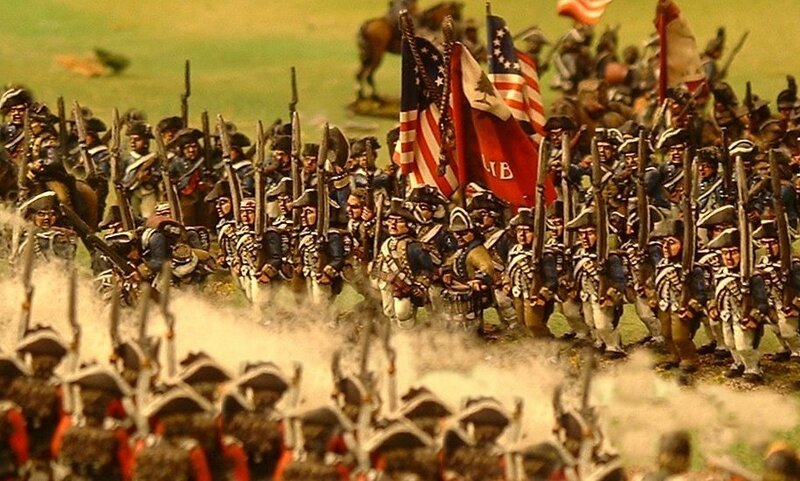 The Americans have only succeeded in pushing back one British unit, when to their right they hear the beating of drums as Baron von Riedesel’s Hessians arrive on the battlefield, thus extinguishing any hope of the Americans forcing the British out of the Freeman’s Farm position. So in our game the British win. This would possibly have had a major effect had this happened in the real battle. It was the British surrender at Saratoga that finally induced the French to take part in the American War of Independence. In our game, this might not have happened ….! 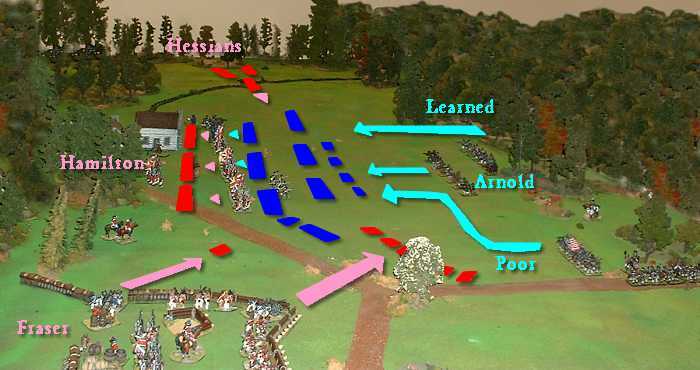 This overview of the battle shows how the game progressed. You can see where Fraser’s men issued out of the redoubt at the very start of the game, and how they forced Poor’s brigade to make some complicated manouevres instead of directly attacking Hamilton’s position. Meanwhile, the British backstepped to form a better defensive line closer to the farm, and then the subsequent huge American assault on the centre took place. 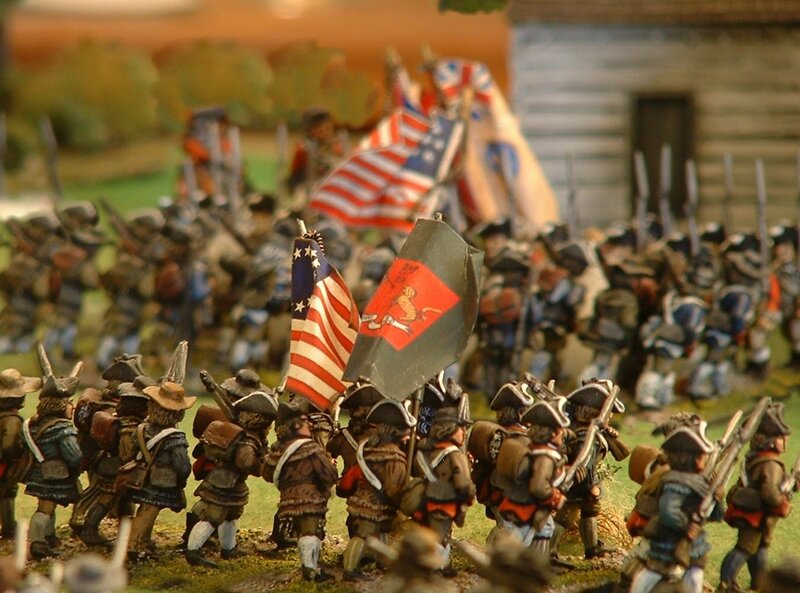 Right at the end of the battle, the Hessians arrived on the British left to cement their victory. 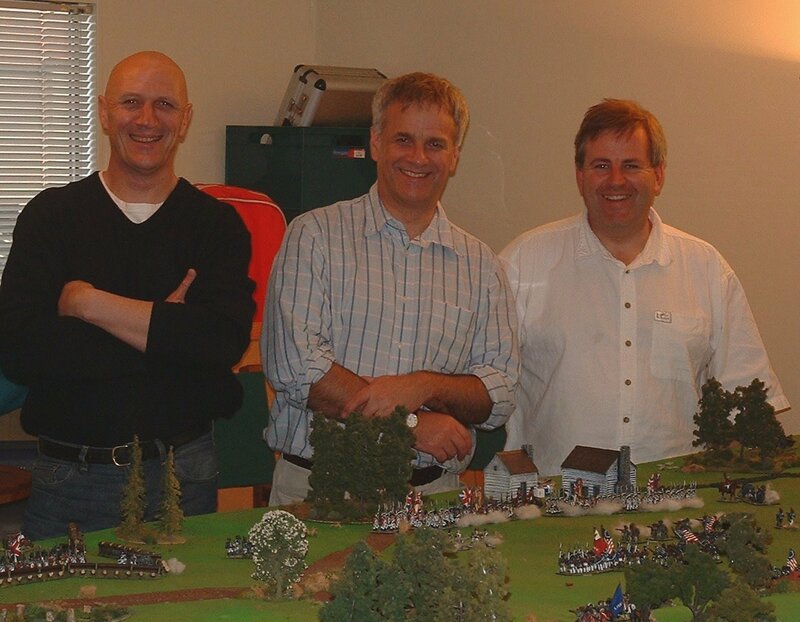 The players – Paul Crouch (Generals Learned and Arnold), Roly Hermans (General Poor) and Steve Sands (British/Hessian), all members of the [then] Kapiti Fusiliers Historic Gaming Club in Paraparaumu, New Zealand. Paul’s son Rylan enjoyed the game too! 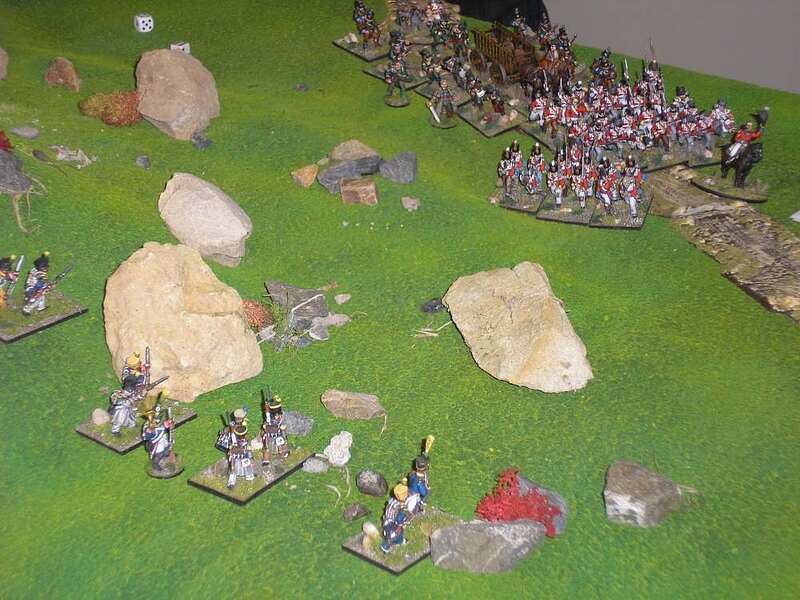 Back in May 2009, the now-defunct Kapiti Fusiliers website published the following game report of our first game of the Too Fat Lardies’ Sharp Practice rules for skirmish battles in the age of black powder. As this was our first game with these rules, we got a few things wrong. But overall the rules worked, and a story emerged from the chaos. I thought it was such a fun game report, that it’s worth re-publishing here for your entertainment. 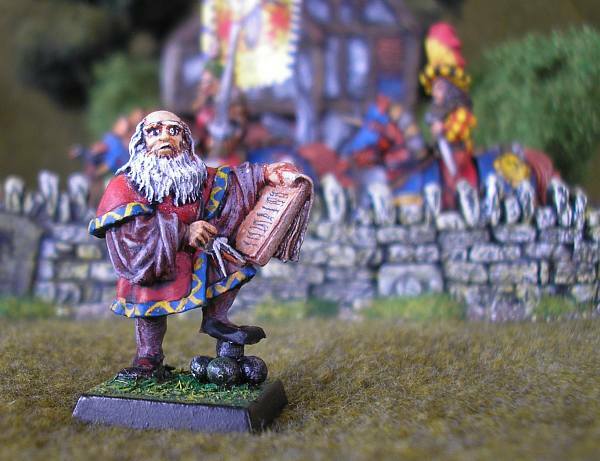 The scenario we played was Fondler’s Colonel from the The Compleat Fondler scenario book, also by the Too Fat Lardies. Captain Richard Fondler, of course, is a take-off of that well-known mullet-wearing 95th Rifles officer, Richard Sharpe. The premise of the game is that the British are to pick up a Spanish spy, the Marquesa de Una Paloma Blanca, who is currently under the care of Abbott Costello at a local monastery. At the same time, they are to deliver a cart-load of gold to a Spanish guerilla chieftain, El Cascanueces. Meanwhile, Colonel Daniel Laroux of the French Imperial Intelligence Service is setting a dastardly trap to capture his hated nemesis, Captain Richard Fondler. Before you continue reading this game report, you might like to scroll to the bottom of this page to read the scenario notes leading up to this battle. Spoiler alert: if you intend to play this scenario, be aware that there are some spoilers contained in the scenario notes. 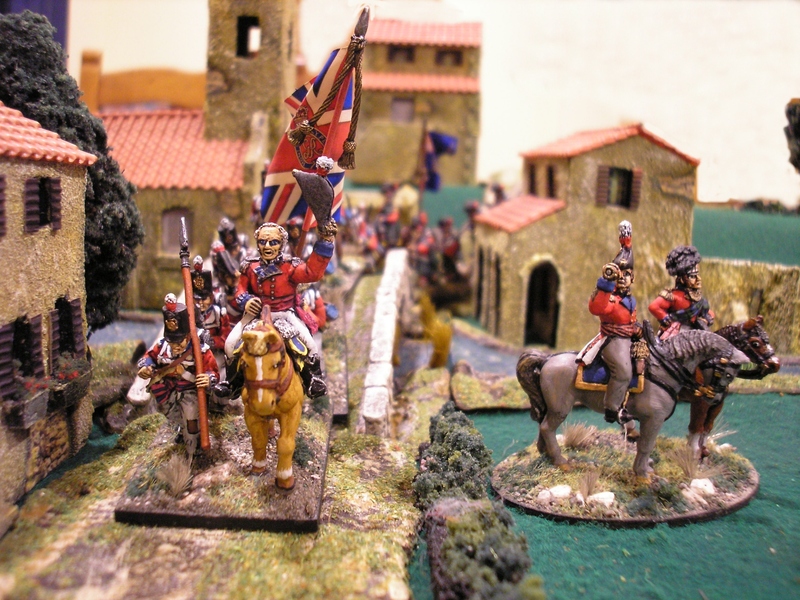 (above) Colonel Grabbe-Ghoullies, the new commander of the South-East Essex, leads the column to rescue the Marquesa. With his ‘extensive’ Militia (sorry, Miwitia) background, Grabbe-Ghoullies feels he should be the one to rescue the beautiful spy (and no doubt reap whatever rewards are on offer), not Fondler and his Rifles (sorry, Fondwer and his Wifles). No low-born guttersnipe who has become an officer out of the ranks (sorry, wanks) will outshine him. 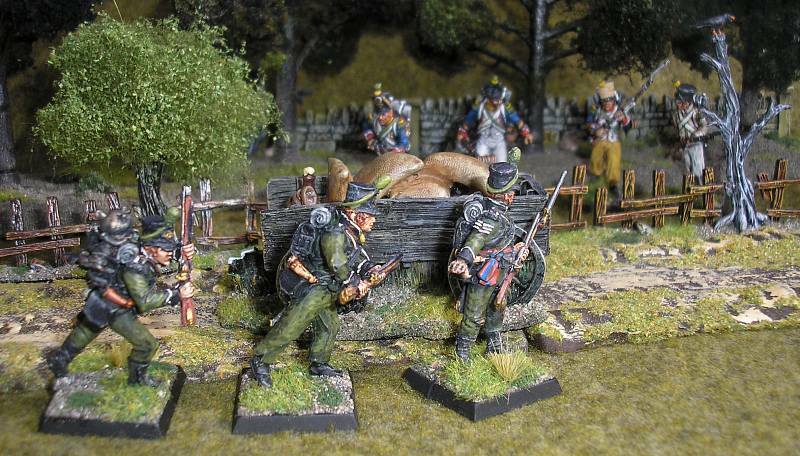 So he orders Fondler’s Rifles to a lowly wagon-guard role. 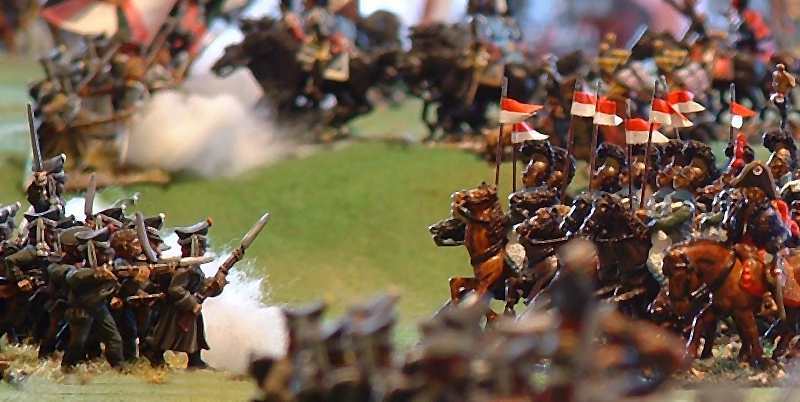 The scenario rules state that the Rifles can’t do anything major until they are either fired upon or the redcoats suffer three or more casualties. 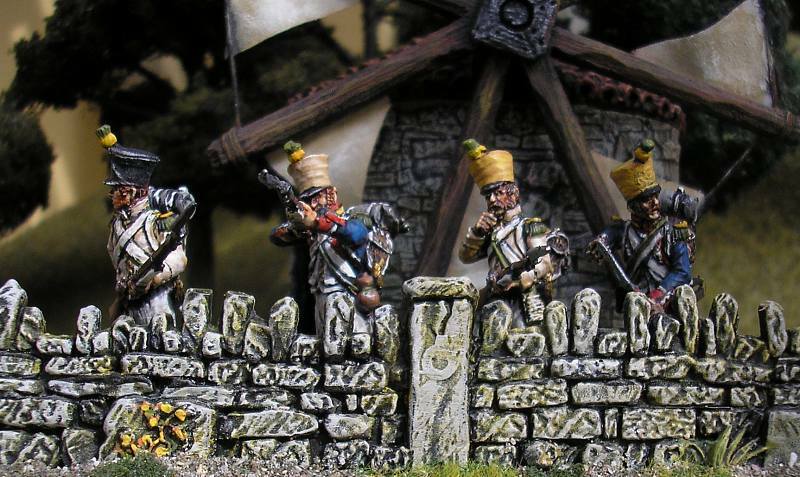 (above) French voltiguers under the command of Caporal-Bugler Petain (don’t ask – I just didn’t have enough ordinary French NCO figures, so used a bugler instead!) open fire on the British column from their eyrie amongst the rocky outcrops. 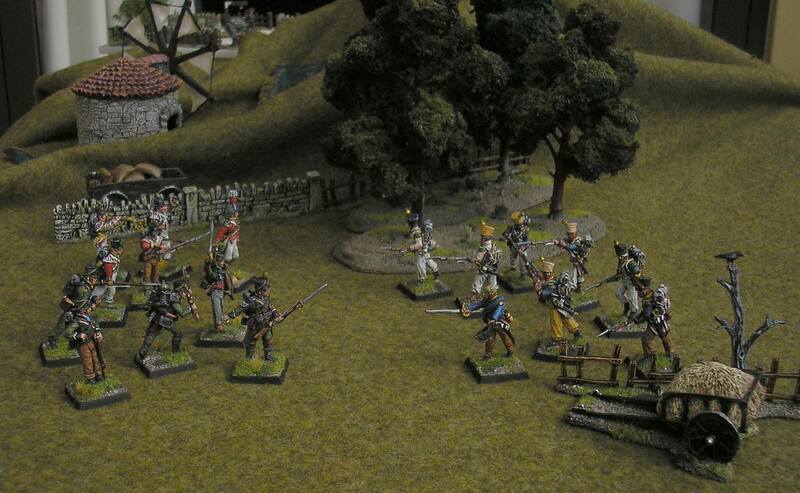 Lieutenant Harry Cost peels his company of redcoats away from the column to chase off these pesky skirmishers. (above) Oh dear, the skirmishers score a kill on Lieutenant Cost’s company. 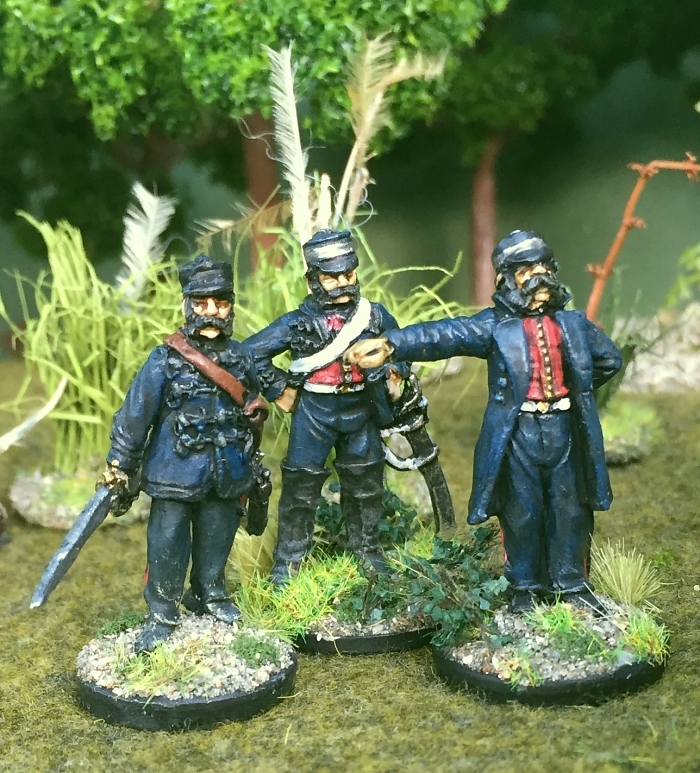 Captain Fondler and Sergeant Paisley of the Rifles look on helplessly, still being under Grabbe-Ghoullies’ orders to stay out of the fight and guard the wagon. (above) Caporal-Bugler Petain’s cornet catches the sunlight, making a perfect target for the redcoats. A bullet flies right down the cornet’s tube, badly wounding the caporal-bugler. His voltiguers obviously don’t think too much of him, because he is left lying in the hot sun for the remainder of the game, instead of being carried to the rear. Shortly after, Sergeant Ducrot, another French NCO, runs up the hill to take over command (not in this picture yet), so no major damage is done (other than to poor Petain and his cornet, of course). (above) Harry Cost’s men blaze away furiously, while Fondler grits his teeth and wishes they would just get up there into the outcrops and weed those Crapauds out – or send in the Rifles to do the job. Even his wagon has been taken away from him now. 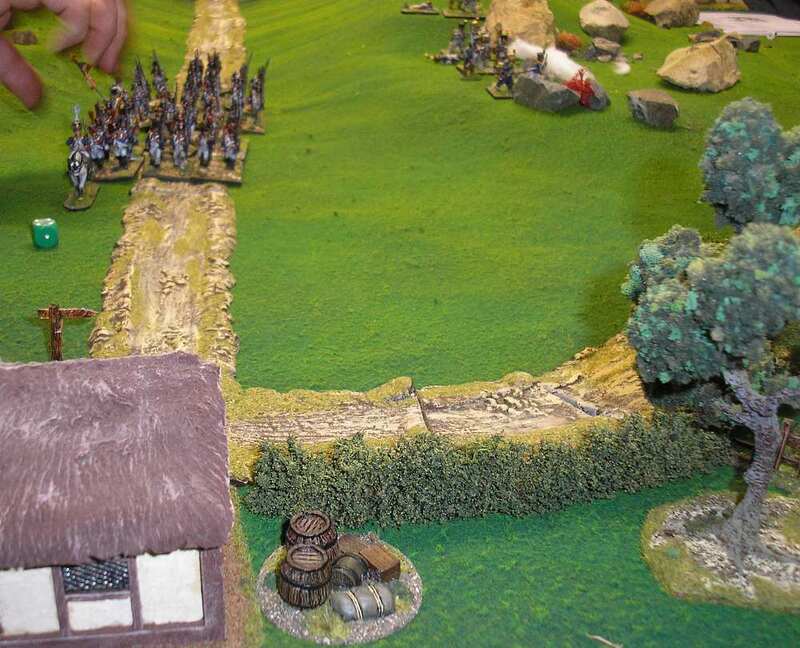 (above) Grabbe-Ghoullies finally gets his column moving – or inching- along the road, taking the gold cart with him, ordering Fondler to deal with the skirmishers at last. (above) But hark, what is this? Do you hear the sound of drums coming from up the side road? 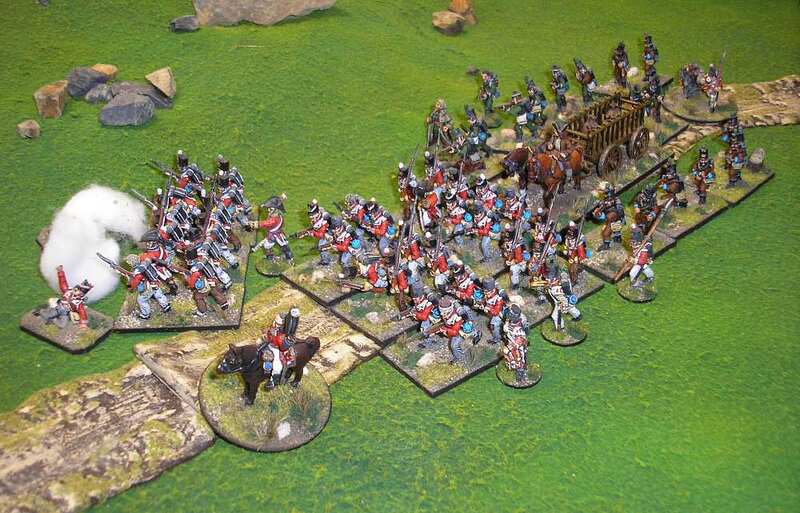 (above) Four companies of French infantry, lead by the Colonel Visage de Vache, hasten towards the battle. They were supposed to close the trap after the British passed the intersection, but their attack is launched prematurely and they march steadily towards the intersection before the British get there. 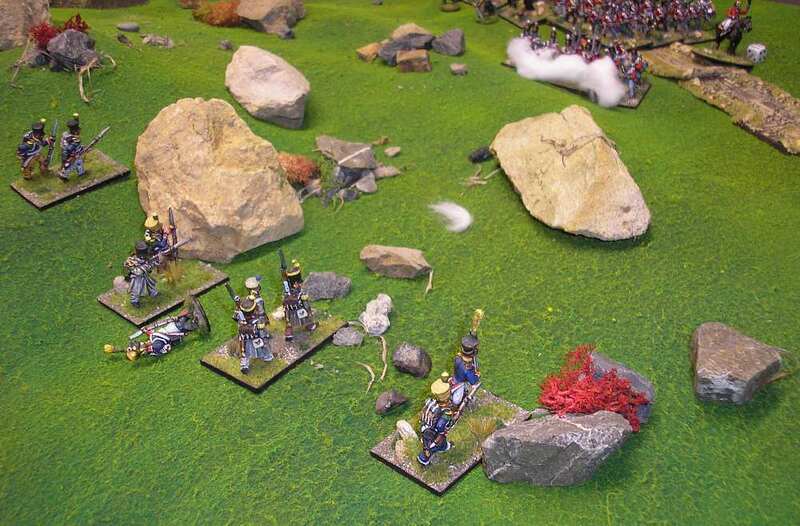 Meanwhile, Sergeant Ducrot and his voltiguers continue peppering the British from the rocky outcrops. (above) Colonel Visage de Vache proudly leads his column out. The grenadier company takes the lead. (above) “Hop to it, mes amis, form line, and let’s give zese Ros Bifs some French dressing!” roars Colonel Visage de Vache to his men. The four companies swing into line with well-drilled precision. (above) Colonel Grabbe-Ghoullies looks around wildly. 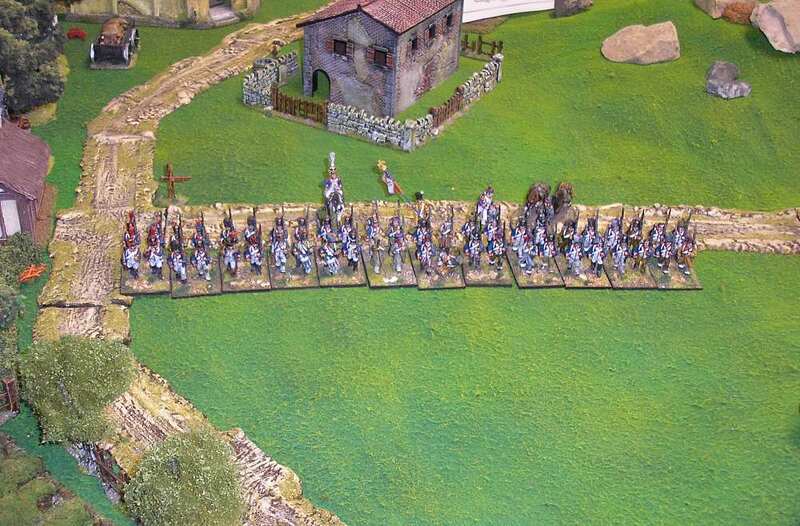 A Fwench line in fwont of him, skirmishers to his left … maybe he should’ve stayed in the compfowtable miwiltia officers mess back in Bwighty. (above) A pall of smoke drifts between the two formations, as the British column is decimated by the disciplined fire from the French line. The British companies suffer so much shock that after two volleys they begin to lose their bottle, and the game ends with a British surrender. 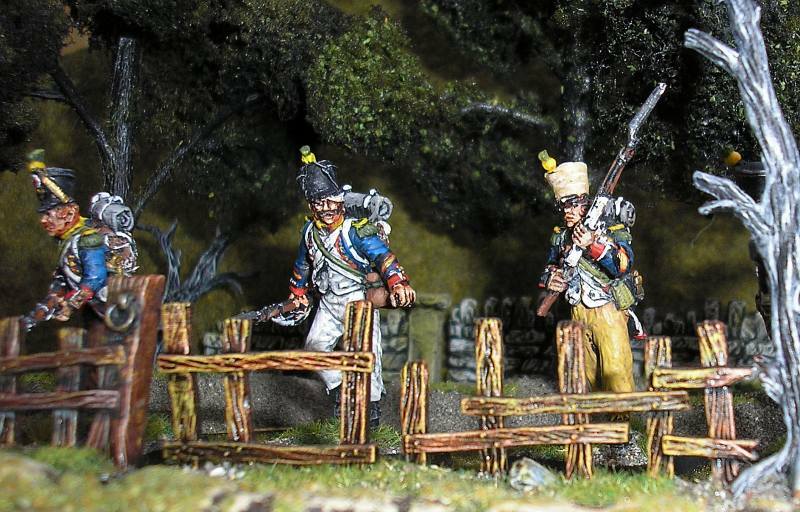 Oddly, it wasn’t till after I took the above photo that I noticed that Grabbe-Ghoullies, who had supposedly been badly wounded in front of his men by the French volleys, had not been wounded at all, but merely scarpered into cover (those sneaky British players!). And so, what was the outcome? Grabbe-Ghoullies, only his dignity harmed, will be captured by Colonel Visage de Vache. No beautiful Marquesa to entertain tonight, only a few wats in a locked woom behind the Fwench lines. El Cascanueces, however, is pleased. He had thrown in his lot with Laroux. But with the British surrender, he has got his gold without having to risk anything at all. Abbott Costello sleeps blissfully on, happily drugged with several bottles of cheap French plonk provided by the beautiful (but rather hairy and with big hands, now that he comes to think of it) “Marquessa de Una Paloma Blanca”. He remains totally unaware of all that has happened today. 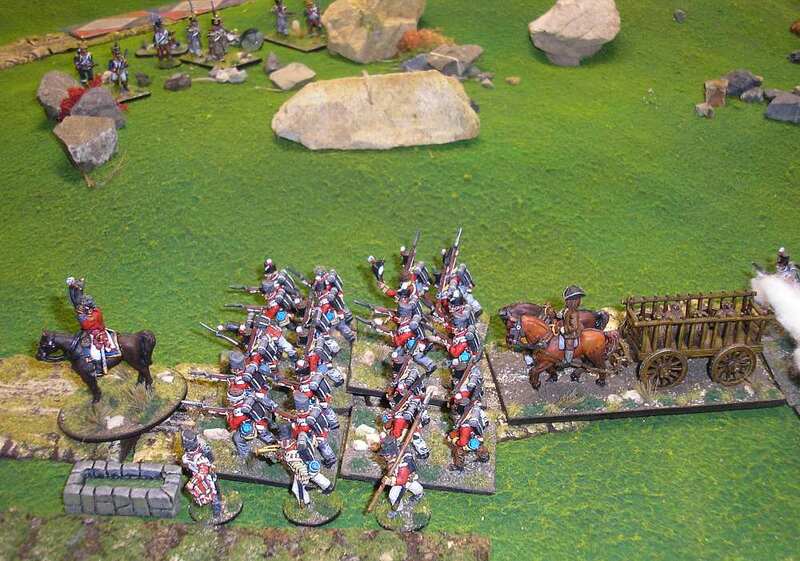 Meanwhile, Captain Fondler and Sergeant Paisley beat a hasty retreat to the British lines. Fondler will have to report to Wellington that he has lost the gold and not rescued the Marquesa. But the two riflemen are sure to march together again one day soon, and retrieve Fondler’s honour. 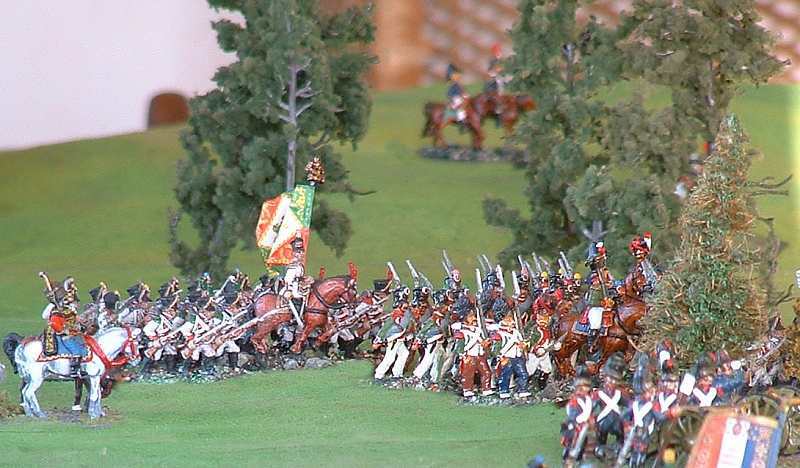 OK, probably not the best of games for the British players, but that wasn’t so much their fault as that of the game-master (er … me) who let the French fusilier battalions come into the battle far too soon, and thus prevented the latter stages of the scenario from playing out. However, it was our first time, so lesson learned! Based almost entirely on the scenario Fondler’s Colonel in The Compleat Fondler scenario book by the Too Fat Lardies. Whatever Captain Richard Fondler had expected of the newly appointed colonel of the 1st Battalion of the South-East Essex, Sir Henry Grabbe-Goullies was not it. After three years fighting in Portugal the British Army had weeded out most of the stuffed-shirts amongst its commanders; they either learnt to fight or had been replaced. But the Army must’ve missed Sir Henry. The colonel paused and stared at the rifleman before him. He had heard much of Captain Fondler, and none of it he liked. Now he could see that the rifleman was fighting to control his anger, confirming Sir Henry’s suspicions that Fondler would not be a good man in battle, would not have the clear head and cold heart needed for command; traits that Sir Henry had, he was sure, in abundance. He stroked his moustaches and allowed his lip to curl into what was both a sneer and a smile of victory. Order would be maintained. CRASH! The door did not so much open as erupt, and a large man with a mop of unruly red hair wearing the uniform of a major of engineers flooded into the room. “Top o’ the mornin’ to you!” the newcomer bellowed. Major Michael O’Stereotype was well known to Fondler; as well as being a major of engineers, he was one of Sir Arthur Wellesley’s exploring officers, roaming through the Peninsula in an attempt to discover information that would harm the Corsican Tyrant and assist the cause of His Britannic Majesty King George. Sir Henry was aghast. He had been told to expect the major, and knew that the man was one of Sir Arthur’s most trusted confidants. It seemed clear, however, that the army in the Peninsula had lost all sense of discipline and propriety. First a guttersnipe who had been promoted to a captain, and now this bog-trotting buffoon! The buffoon spoke, and Sir Henry had the distinct feeling that Sir Arthur’s orders were being conveyed to Captain Fondler rather than himself. Fondler looked grim. He and Laroux had indeed met, and on several occasions the rifleman had been instrumental in foiling Laroux’s dastardly plans. In an act of revenge that he now felt he may come to regret, he had smashed the Frenchman’s false teeth. “Well, the Marquesa has been unmasked,” the big Irishman continued. “It seems that she was caught whilst getting her hands on a list of French spies in Lisbon and only just escaped with her life. In a desperate act the Marquesa made contact with one of Spain’s most notable guerrilla leaders, El Cascanueces. He is escorting her to the Monastery of Madre de Deus, where Abbott Costello, one of our agents, will protect her until we can arrive. In the ensuing silence Fondler could almost hear Sir Henry’s brain at work, his discomfort and anger as clear as Fondler’s had been earlier in the conversation. Then the colonel spoke. The colonel turned to the rifleman. 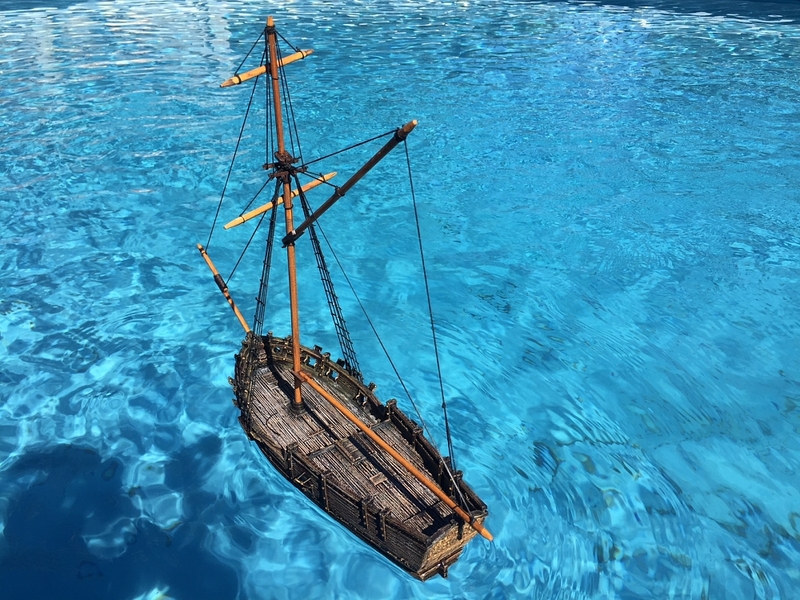 “Captain Fondwer, be weady to march at 10 o’clock tomorrow morning.” Then, secure in the knowledge that he had out-manoeuvred both the captain and the major, he dismissed them from his presence. Too many years ago for me to recall, as a callow twenty-one year old youth, I made my first overseas trip from New Zealand. 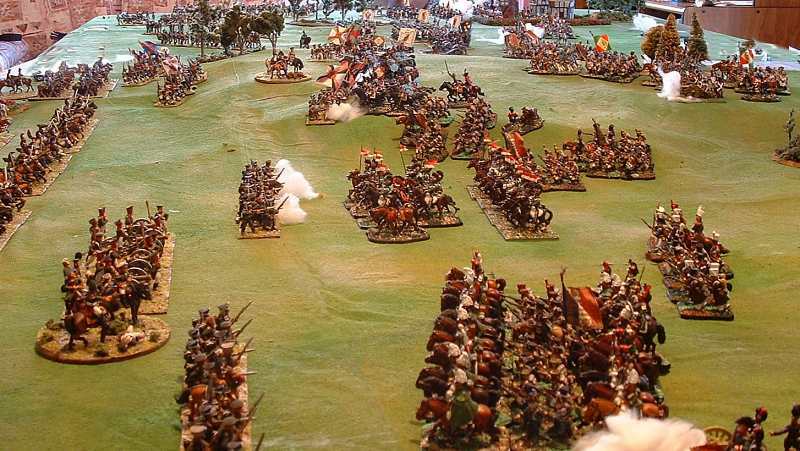 This was during my first bout of enthusiasm for the wargaming hobby (my present involvement in the hobby was rekindled in my 40s), so I made a point of visiting some of the European shangri-la’s of miniature soldiers. One of the most impressive of these was the Plassenburg Castle. This medieval fortress, nestled picturesquely above the beautiful Bavarian town of Kulmbach, houses a museum containing literally hundreds of thousands of flat tin soldiers, or “zinnfiguren” as they are known in Germany. I couldn’t resist buying a few flat miniatures to keep as souvenirs. 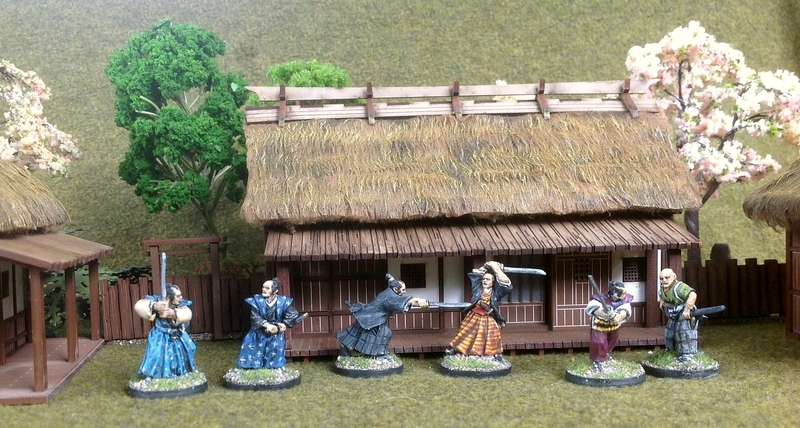 When I got back home to New Zealand, I painted the figures and arranged them onto bases. Since then these dioramas have accompanied me through the various flats and houses I’ve lived in, surviving my abandonment of the wargaming interest for twenty years, until my return to the hobby four years ago. Over that period, they have survived remarkably well, considering their fragility. One halberd has snapped off, and the varnish has yellowed somewhat. But otherwise they are all still as good as new. I’m afraid I can’t tell you too much about the painting techniques I used, as I’ve forgotten, it was so long ago. I’m not even sure if they were done in enamels or acrylics! Here then, for your enjoyment and edification, are pictures of the flats in my small collection. 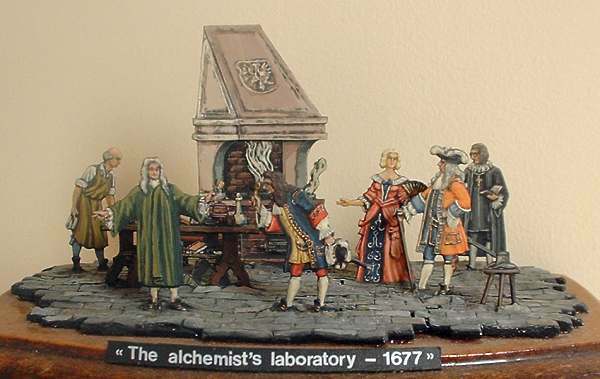 The first diorama, containing figures made by Maier, depicts a laboratory in the Plassenburg in 1677. The alchemist Krohnemann is showing Margrave Christian Ernst something that might just be gold (but probably isn’t!). There is also another gentleman and his lady friend, a priest, and an assistant. Even the table and stove are completely flat. As I recall, I made the bricks for the base out of Das modelling clay. The rather ugly title was made with Letraset (remember, we didn’t have PCs with printers back then!). 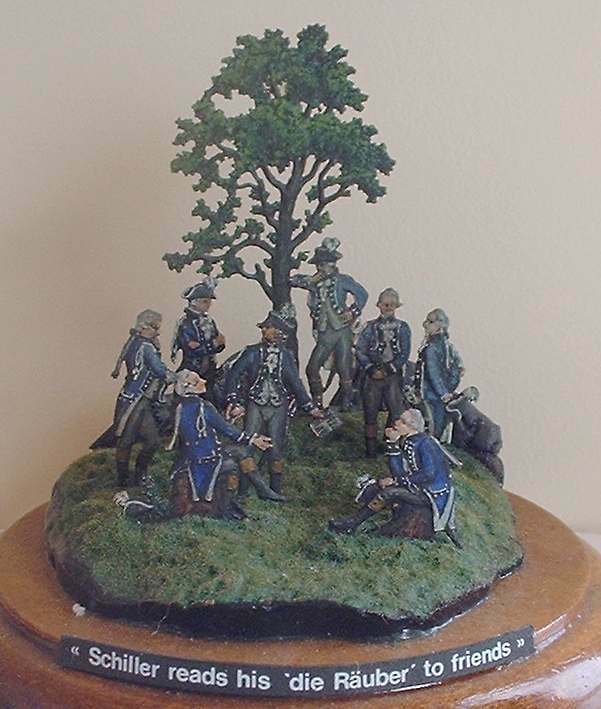 The next diorama depicts the great German writer Friedrich Schiller reading from his drama “Die Räuber” to his friends. He attended the Duke of Wurttemberg’s military academy, the Karlsschule, and was forced by the domineering duke to study medicine. After graduating in 1780 he became an army surgeon, attached to a military life he abhorred. He wrote “Die Räuber” in 1781, so perhaps this group of friends are fellow officers from the Wurttemberg army. The tree (also flat) came with this set, but I made the stone fence and the terrain from Das modelling clay. The ground has been covered with static grass. The final group shows a princely travelling carriage, circa 1560. The carriage is accompanied by a horseman and two halberdiers. At one stage I did know who was in the carriage, but unfortunately I have long since lost those details. If I remember correctly, it was a wedding ceremony of one of the Kulmbach nobles. I never got round to basing this group (which probably accounts for the fact that this is the only group that has incurred some damage over the years – one of the halberdiers now has a broken weapon). So, there we are, that is my small collection of flat figures. They certainly have a charm of their own. The animation and anatomy are perfect – the makers were true artists. 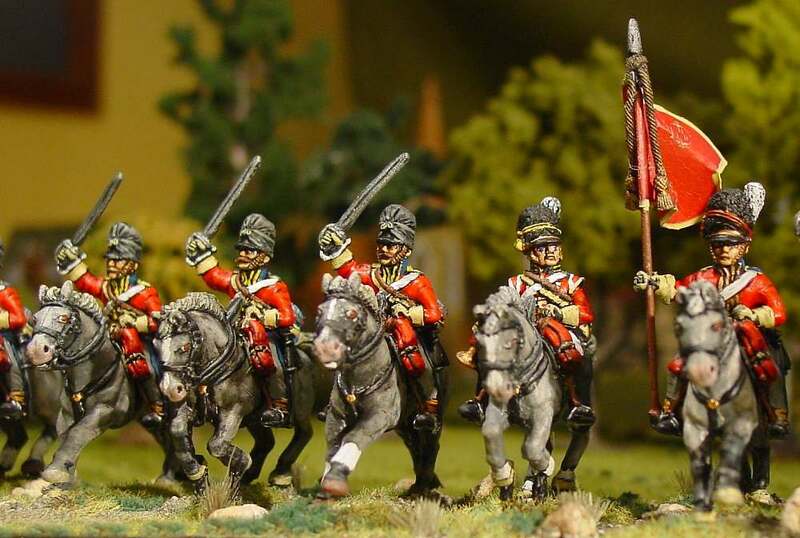 Of course, they are of no use whatsoever for wargaming, but they certainly look nice in my study! This article first appeared on the now-defunct Kapiti Fusiliers website on 10 September 2003. The story still holds true today thirteen years later, though I did have a wee accident and dropped the top base, so it needs some touching up. 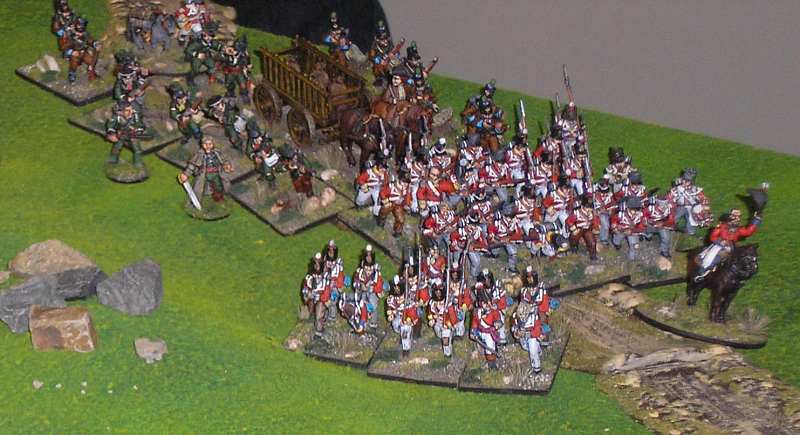 Back in June 2008 I posted this article about my first 40mm Peninsular War figures onto the now defunct Kapiti Fusiliers website. For your viewing pleasure, here is that article again, as the latest in my series of resurrected articles from the old Kapiti Fusiliers website. 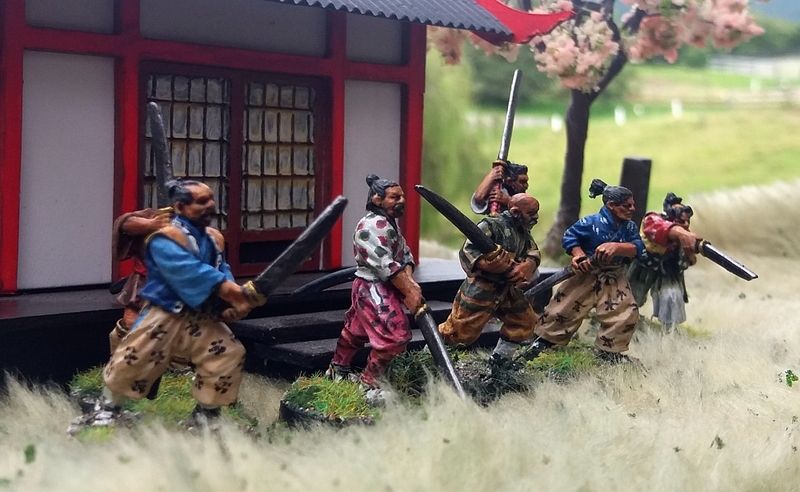 For those of my readers who are not so familiar with the hobby of wargaming, 40mm figures are seen by gamers as somewhat unusual in that they are much larger than the more commonly used 28mm or smaller figures. 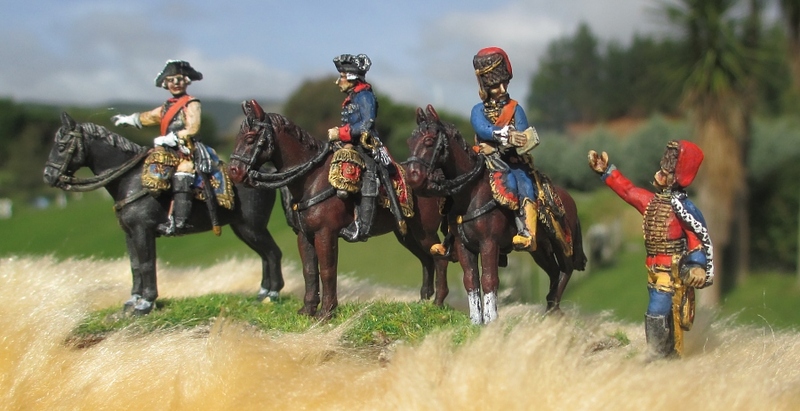 Perry Miniatures have a very attractive range of 40mm Peninsular War figures. 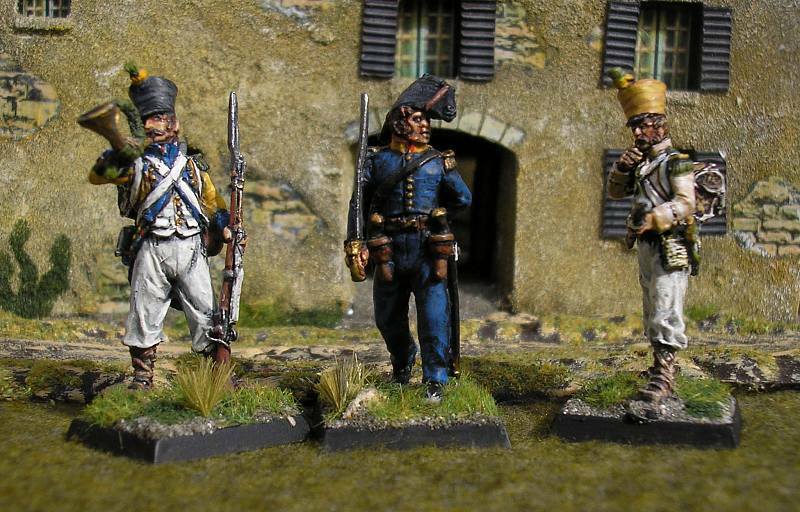 Fusilier Roly Hermans has painted his first few British and French figures for a future skirmish gaming project. 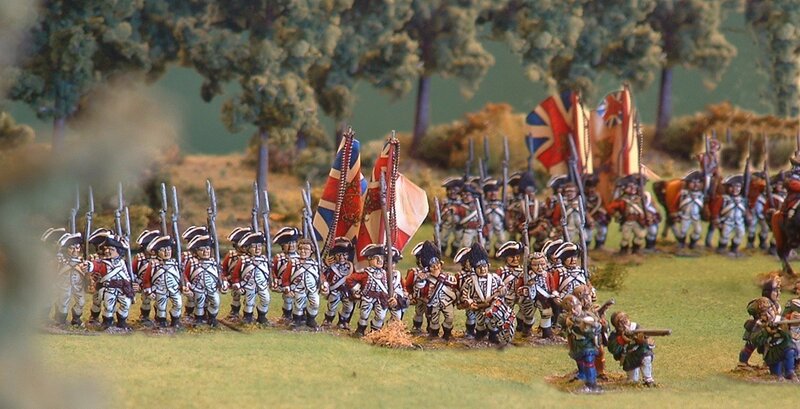 A group of British riflemen and light infantry face off against a similar number of French voltigeurs. 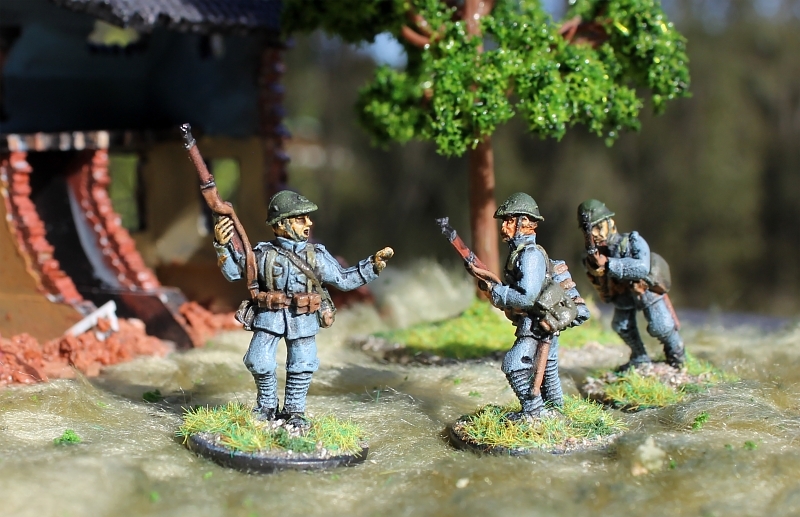 Private Costello, heavily laden with a cooking pot and his officer’s shoes to repair, joins another riflemen as they are beckoned into an ambush position by their sergeant. A British rifleman and rifles officer (certainly not Sharpe, as he wouldn’t have been seen dead wearing a foppish pelisse!). 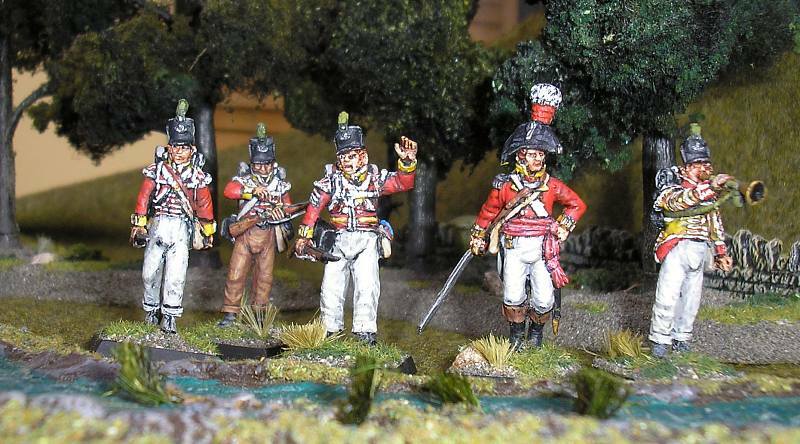 Two British light infantryman, their sergeant, an elegant officer, and the company bugler in reversed colours, about to cross a stream. A French voltigeur cornet in yellow tunic with blue facings, an officer and a voltigeur in waistcoat order. 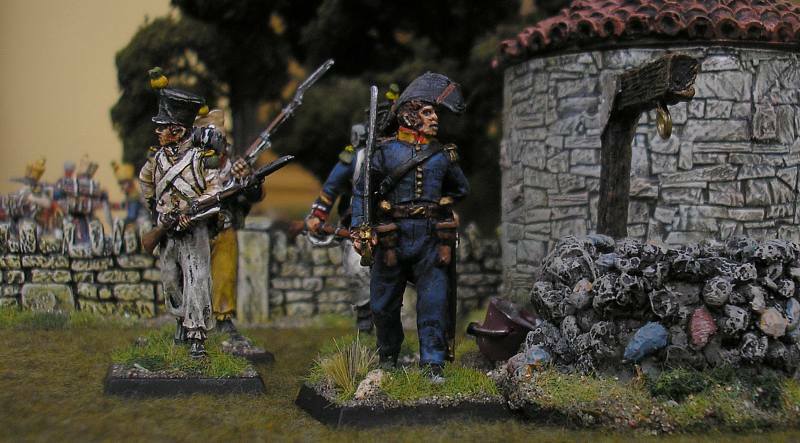 Three French voltigeurs advance in skirmish order. 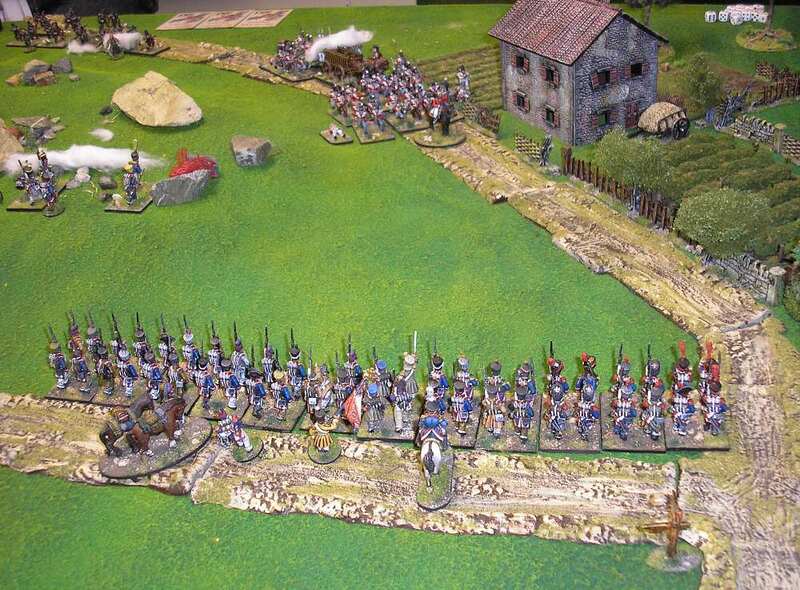 A French voltigeur firing line in action. An officer points to the way to the enemy. British light infantry and riflemen engaged in a skirmish somewhere on the Iberian Peninsula. Postscript, July 2013: As mentioned, the above article first published in 2008. 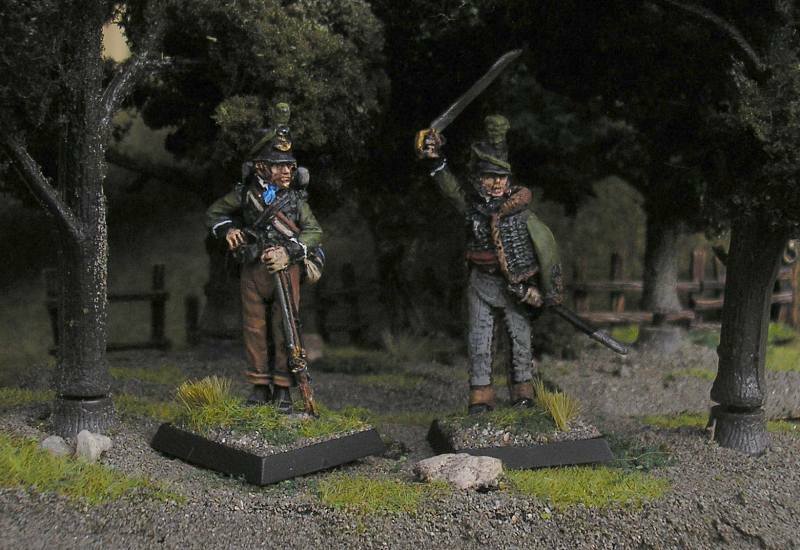 Since then I’ve added a few more figures to the collection (including some rather more Sharpe-ish figures) by the Honourable Lead Boilersuit Company, Sash and Saber, and Trident Miniatures. I’ll try to photograph these over the next few days and show them in another posting. But, sad to say, I’ve never really gotten any further than one test game to actually using my 40mm figures. This is partly because I made a mistake in glueing them onto such light plastic bases, as the added height and weight of 40mm figures make them too top-heavy, and they fall over at the drop of a hat. But even though they haven’t been gamed with, I enjoy the look of these figures, and they form a treasured part of my overall model soldier collection. This weekend marks 150 years since the Battle of Gettysburg, the iconic battle of the American Civil War. 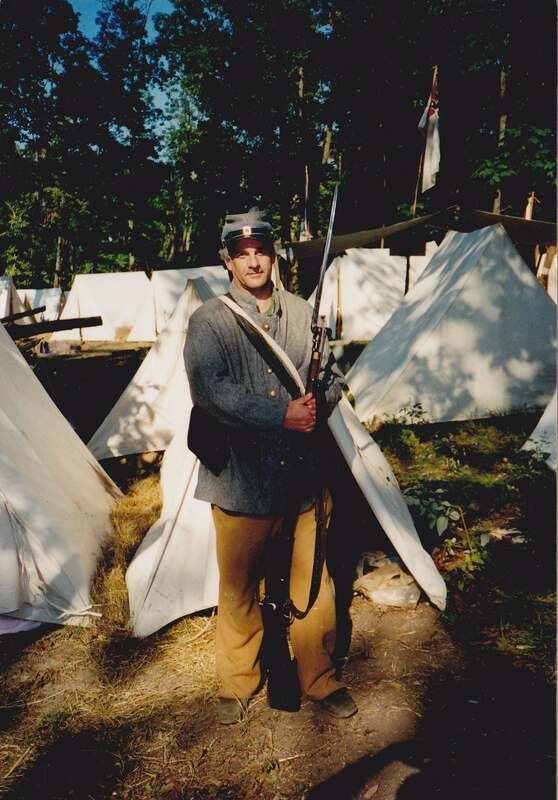 To commemorate this historic engagement, you could re-visit two old postings about my time as a Confederate soldier during the massive 135th reenactment event way back in 1998, first here and then more photos here. We played an American Civil War game. There were four on each side, so eight of us all told, including all my old wargame friends from many years ago. Fusilier Mark Strachan was along there too. The rules used were a set put together by the group up here. They really do work well and capture the flavour of the American Civil War and the ebb and flow of battle. John and the boys certainly put on games ‘in the grand manner’ and there was no lack of troops on the table. It was a magnificent sight. 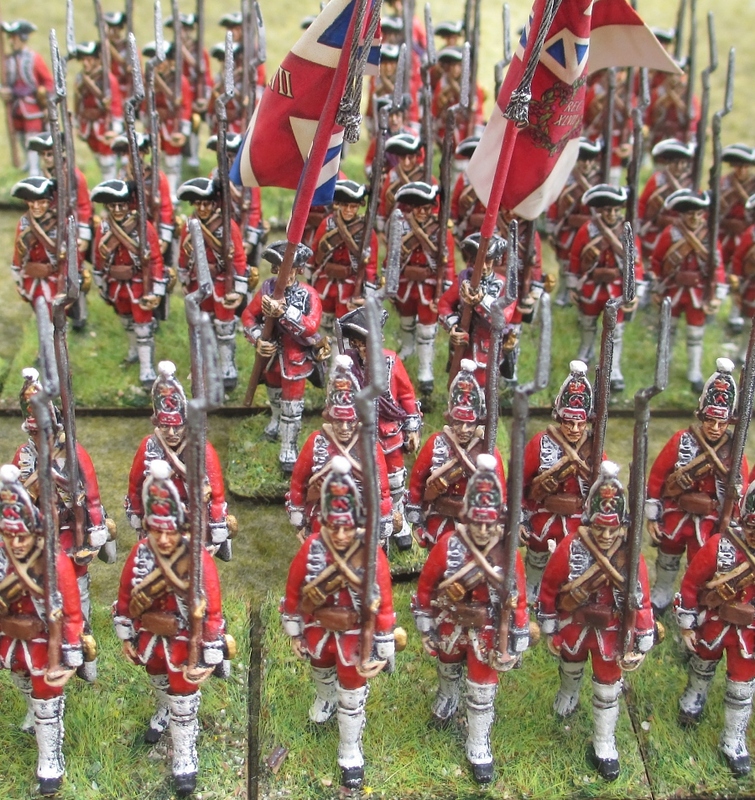 As you can see from the photos we reckon there were up to two thousand 25mm figures on the table. They were mainly Dixon, but Wargames Foundry were in there too. I tried to focus as many as possible of the photos on John’s buildings to let you get the feel of them. Hopefully you can see the work he does on them. The close-up of the forge (below) is brilliant. He scratch builds a lot of the stuff you see in these pictures. Also the limbers and wagons in the photos are all John Berry originals. 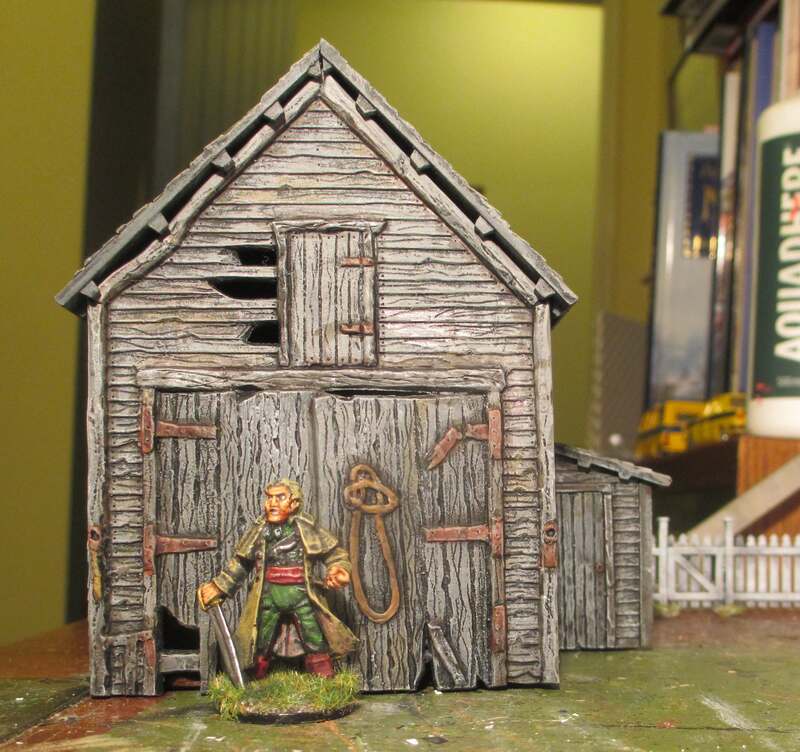 The game was a fictional encounter somewhere in Georgia called Rusty Creek, late in the war … a last desperate attempt to throw the Damn Yankees out. 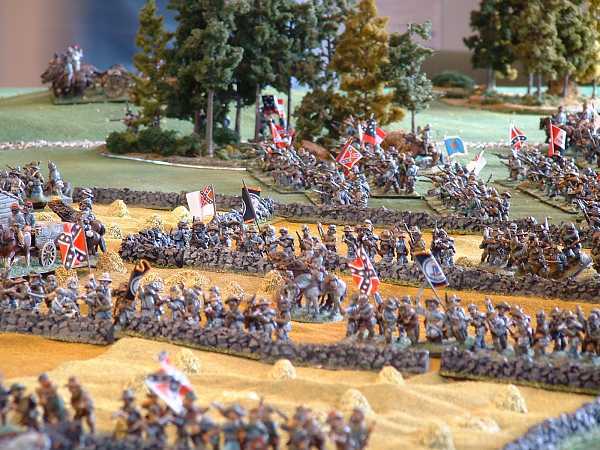 I fought with the Johnny Rebs, and held the left flank with two brigades of infantry and artillery. I was attacked repeatedly throughout the game – in fact my flank was under pressure from the word go. I had three brigade generals killed during the day, a battery of artillery smashed to pieces, and one of my brigades shattered – but they all died gallantly for the cause! 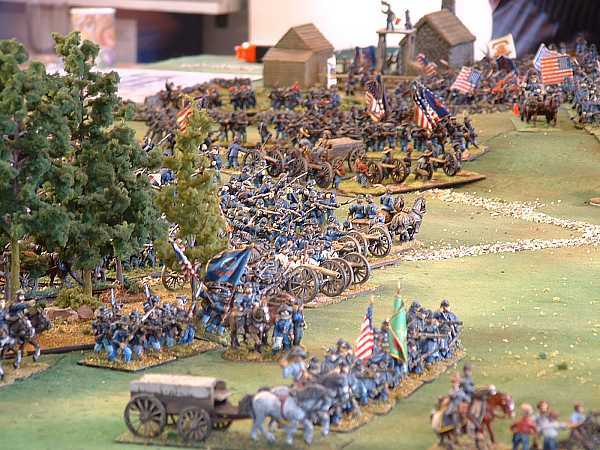 Above: My own Confederate troops make a guest appearance on the left flank. Under pressure for most of the game, and suffering heavy losses, they held the flank with honour. Above: Brewer’s Farm, the centre of the Confederate position. 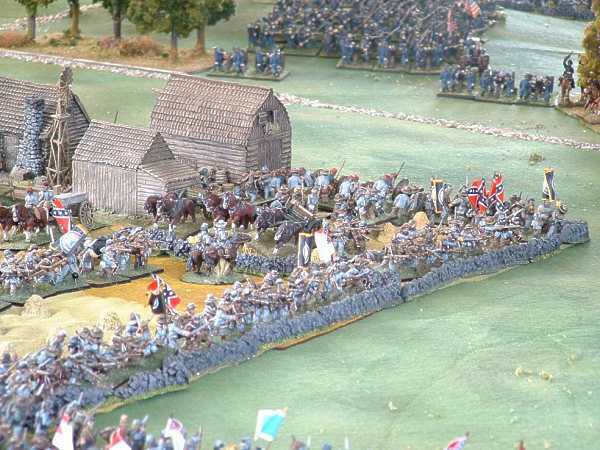 Above: Confederate troops mass around Brewer’s Farm. Above: Through the cornfields come the Rebels under the command of our host John Berry, on their way to prop up the left flank. This shot reminds me of a scene from the movie Gettysburg … stirring stuff! 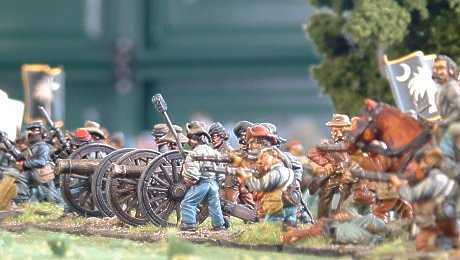 Above: Union troops – loads of artillery. 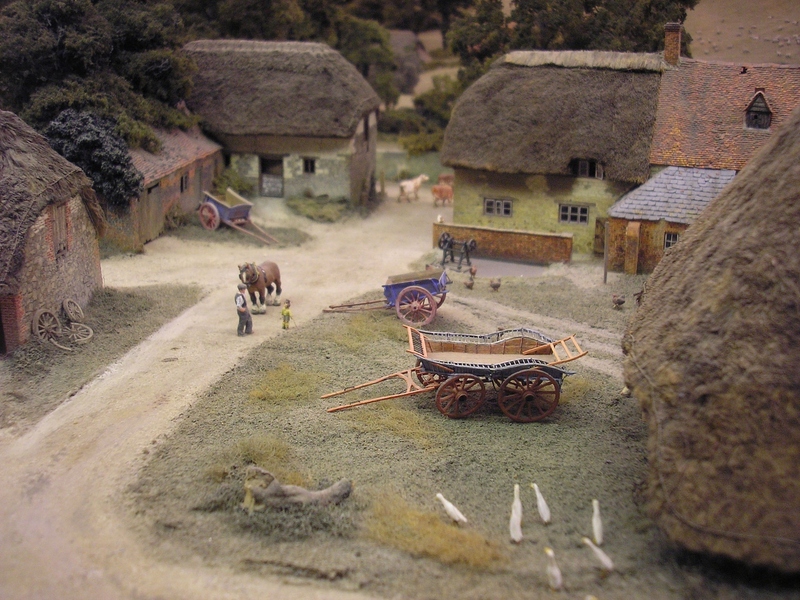 Note the wagons that John Berry has made. Above: Reb cavalry under Forrest move out on the right – almost to a man these brave lads were wiped out before the Reb infantry arrived. After the smoke died down it was decided that (as in all these large games) a fighting draw was the outcome. 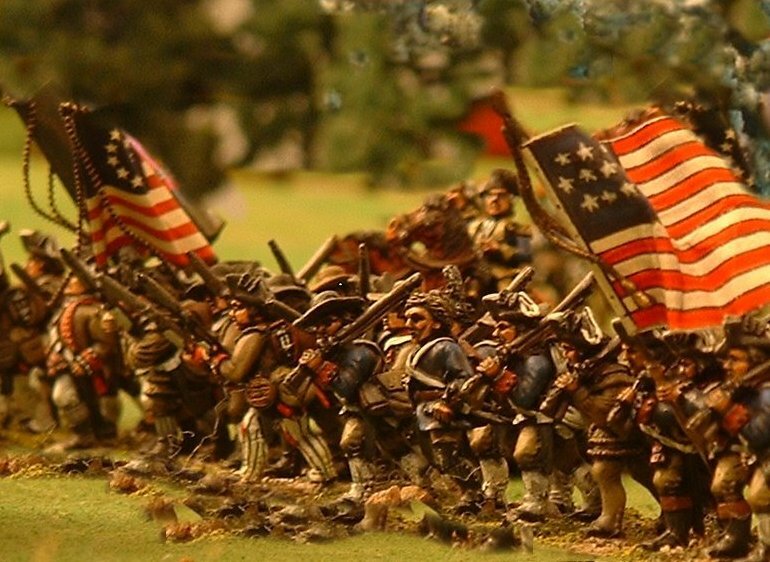 The Union hadn’t really coordinated their attacks, and the Rebs had defended stoutly in the face of the blue tide. Juicy pics of exquisite scenery feature in this latest of my resurrected postings from the old Kapiti Fusiliers website. 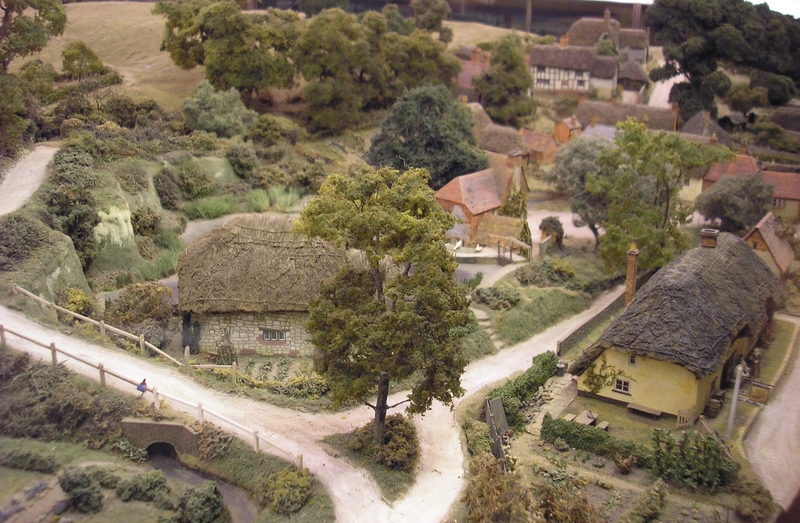 Originally posted on May 2008, this photo-article describes a describes my visit to the Pendon Museum of Miniature Landscape and Transport during a trip to the United Kingdom. Don’t forget to click on the photos – I’ve made them quite big so you can get the full effect! Like many wargamers, I’ve always had a fascination with the hobby of railway modelling. As a child, I was presented with a beautiful book of photos of model railways from round the world. 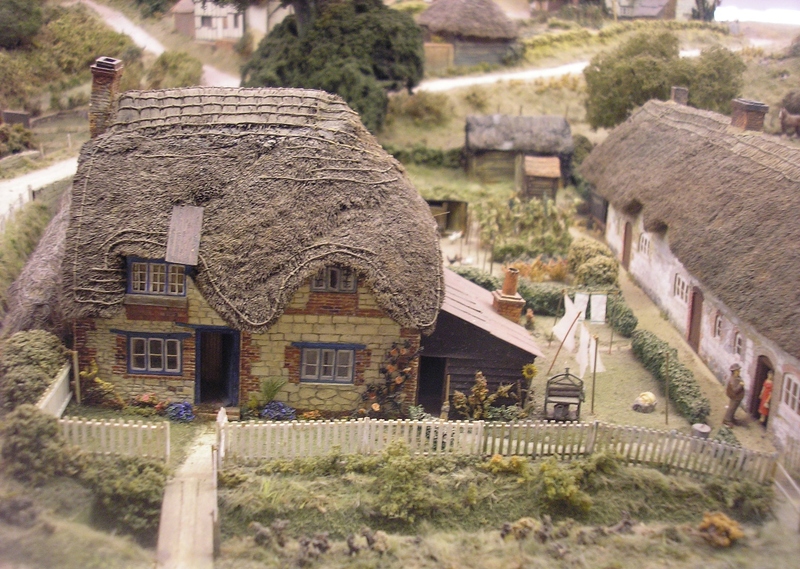 I recall being particularly impressed with the pictures of a layout of exquisite Lilliputian cottages known as Pendon. During my trips to the UK in the late 1970s and 80s, I tried to visit Pendon, but for some reason I never succeeeded in getting there. For decades I never gave Pendon much more thought, until this year when my family and I went to stay with my sister-in-law in Oxfordshire for a week. I was idly browsing through a local map of their district, when the name ‘Pendon Museum’ jumped out at me. “Oh, that’s in Long Wittenham, just a few minutes down the road,” I was told. So, a childhood dream came true when we drove into a pretty little village and parked outside a rather modern structure housing this famous layout. I dreaded that my family, who had also come along, would quickly get bored and want to pull me away to other sightseeing, but fortunately this turned out to be a magical experience that entranced all of us for hours. When Roye England moved to the Vale of the White Horse during the 1930s, he was so concerned at the changes happening in the local landscape that he conceived the idea of preserving it in miniature. 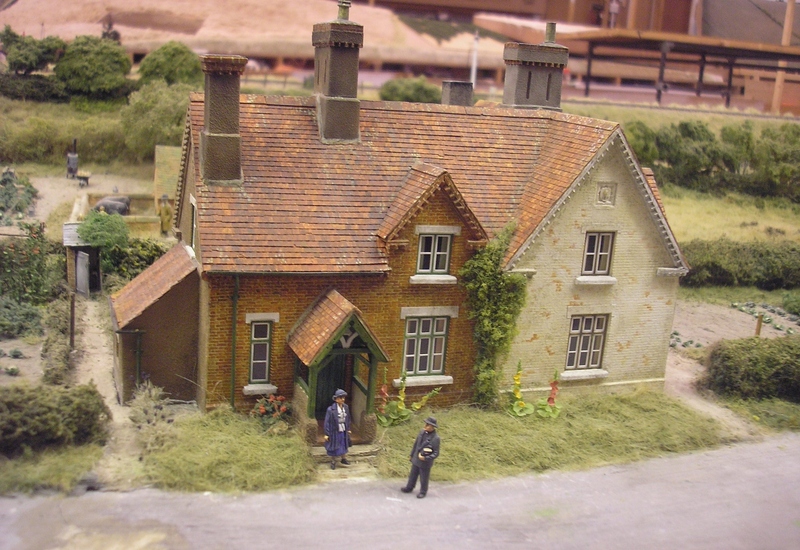 The result is a huge layout (some 2000 square feet) that depicts an imaginary tract of the Vale in 1:76 scale, with villages, farms, quiet lanes, a railway and all the other features of the 1930s English countryside. Although the model was begun in the 1930s, and the museum itself established in 1954, the project is nowhere near finished. Each structure or piece of terrain is a mammoth project, involving many, many hours. 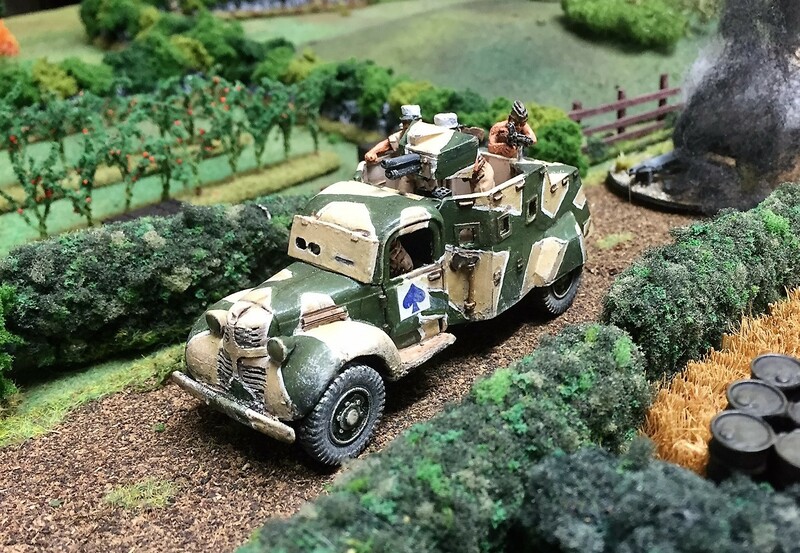 Of course, from a wargamer’s perspective, this model of an idyllic sunny summer afternoon in the mid-20th century Vale only lacks one thing: a shower of miniature German paratroopers dropping in on some stalwart British Home Guardsmen! 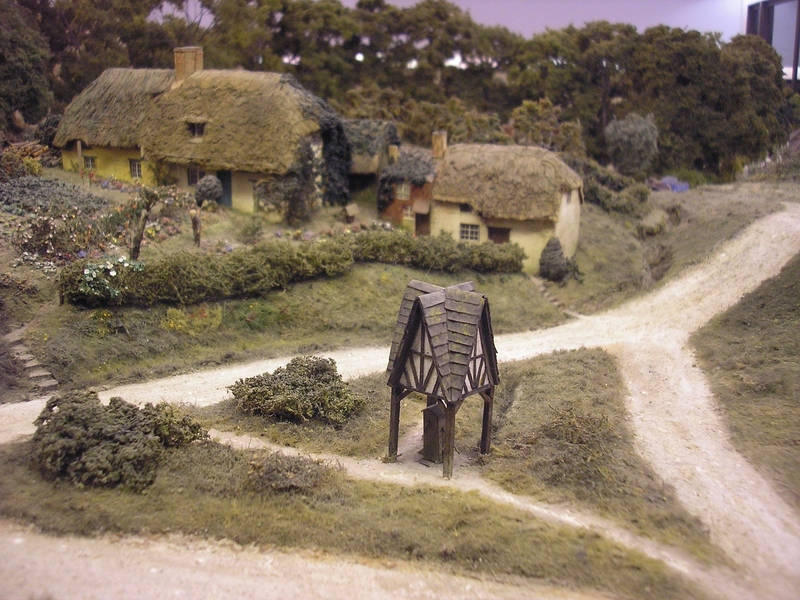 The village of Pendon Parva. 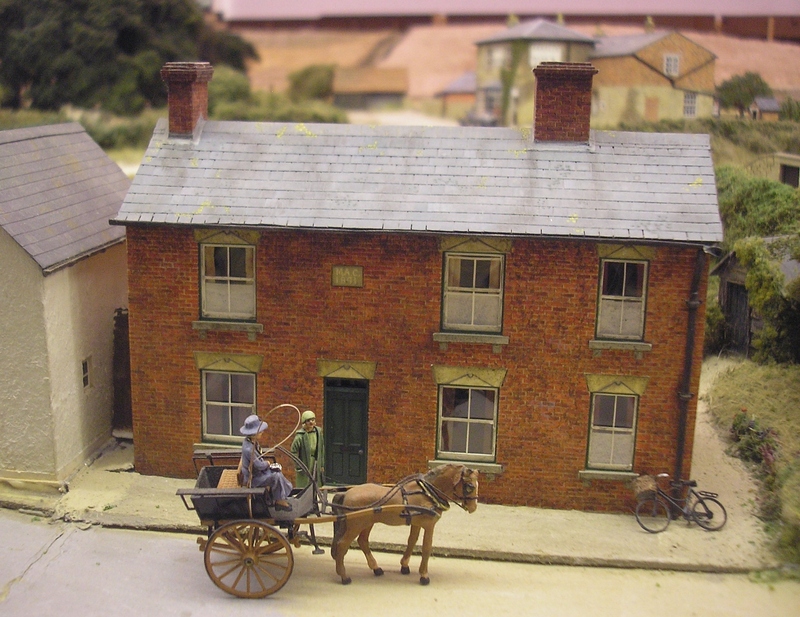 The yellow building on the right is the Waggon and Horses Inn, finished by Roye England in 1936, the first model in the layout. Note: click on this and the other pictures in this article to enlarge them. This house is known as “77”, and is a replica of a real building in South Marston. Like the other buildings in Pendon, it is made out of cardboard to a scale of 4mm to the foot. This deceptively simple model of a Victorian cottage shows the delicately handpainted brickwork that is a feature of the Pendon models. Each brick, only 1mm high by 3mm long, is embossed into the cardboard and then individually painted with watercolours. The farmyard at Bradbury Farm. I love the intricate cart models. 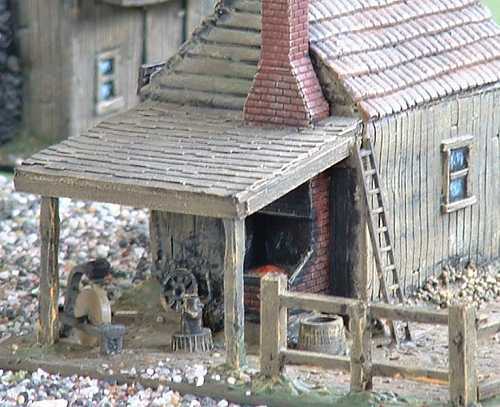 The thatch on the roofs of many of the Pendon models is painstakingly recreated using small bundles of plumber’s hemp. Every flower in the garden is individually modelled. A chalky junction in the quiet village. Doesn’t it just need a jeep and a motorcyle courier, with the drivers looking at a map to see where they are, to complete the scene?! A lane winds off into the distance. 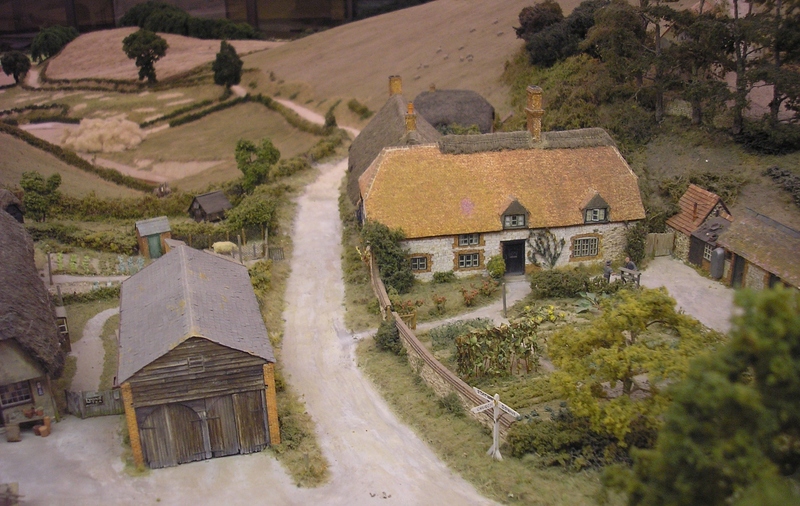 Note the vegetable garden – it is said that the smallest model in the layout is a moth on one of the cabbages. A GWR delivery truck is reflected in the quiet waters at Upper Mill. 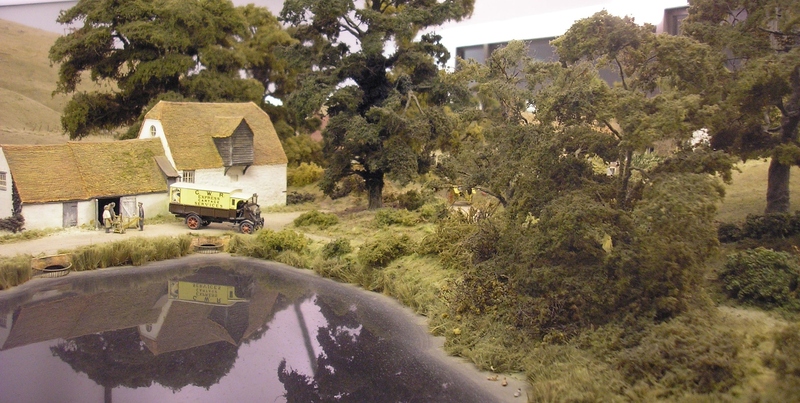 And, yes, most of the trees being made for the layout these days are based on Woodland Scenics. You can visit www.pendonmuseum.com to find out more about this wonderful museum. This resurrected posting was one of the most popular on the old Kapiti Fusiliers website. It describes a huge Command Piquet game that took place back in April 2005. 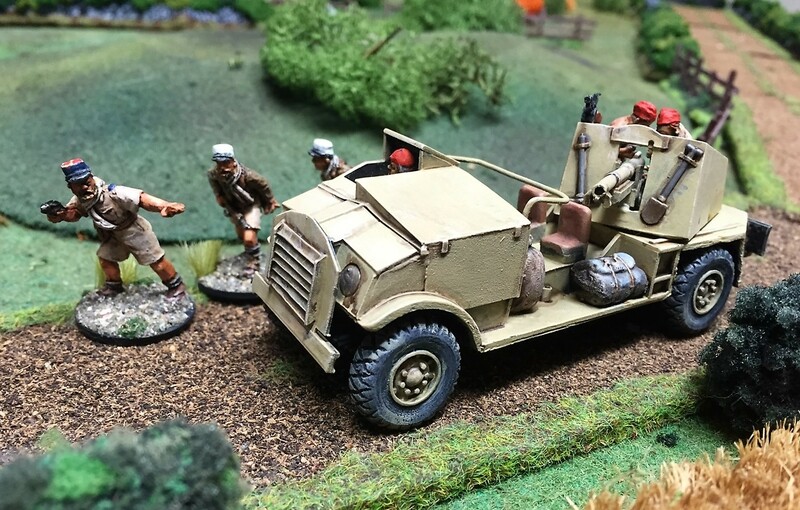 The article was originally written by Fusilier Brian Smaller (who now has his own fascinating Woolshed Wargamer blog) and the dramatic pictures were taken by Fusilier Paul Crouch. Above: Fusilier Greg Simmonds debuted several bases of Russian generals in this game. 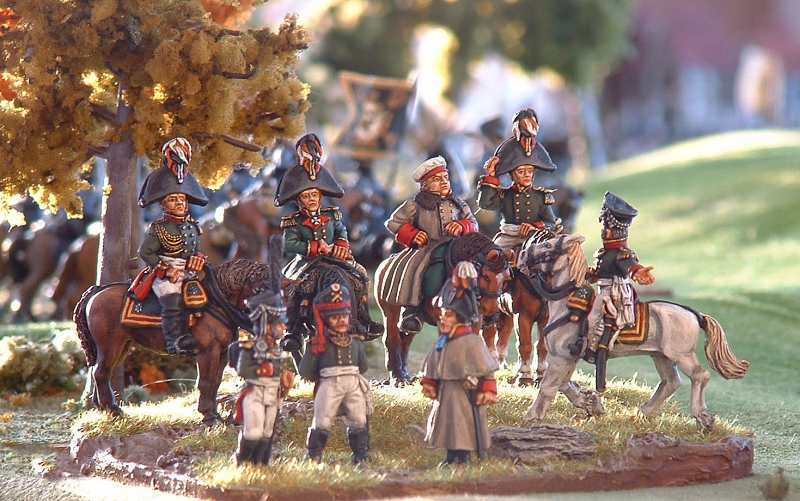 These are beautifully painted mini-dioramas, featuring various Front Rank and Foundry figures, many of them heavily converted. 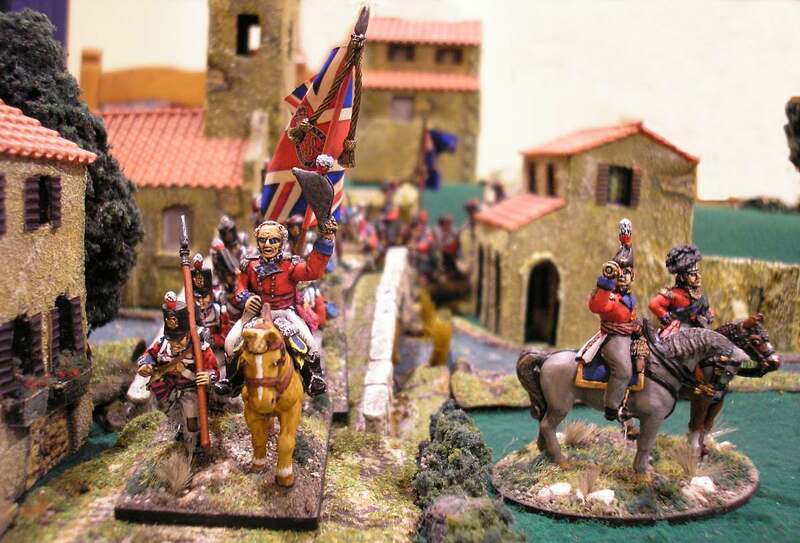 The opportunity to play a Napoleonic war game on a 12’ by 6′ table with over a thousand painted figures doesn’t come along every day, so when Fusilier Greg Simmonds suggested such a game we jumped at the chance. 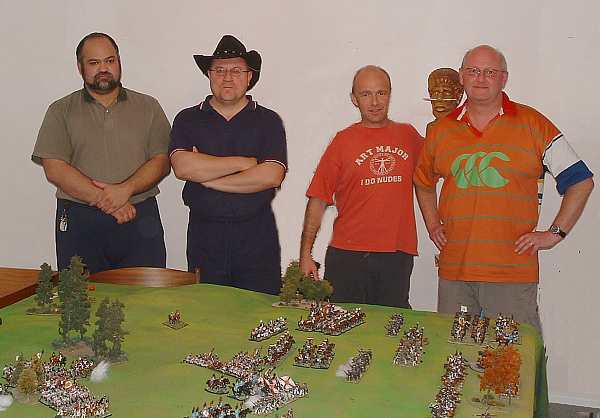 The players who made it to the battle were Fusiliers Greg Simmonds, Peter Haldezos, Shane Saunders and of course, myself. The game was played in Greg’s lounge room, on a table suitably stabilized with six trestles. Given the weight of metal I think Greg’s field engineering was commendable. 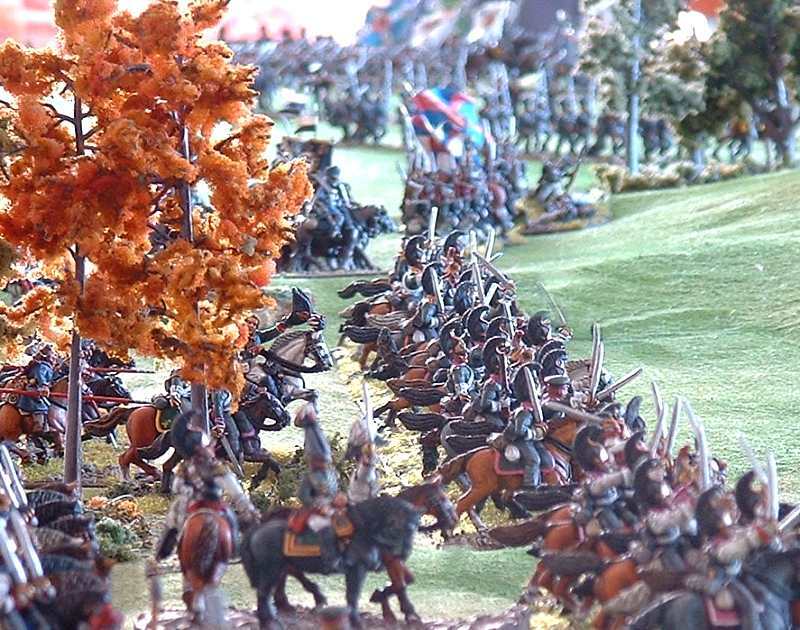 The table was a scaled down section of the field of Austerlitz with, from the French perspective, a village on the right flank, a plateau in the centre and large expanses of open fields on the left. 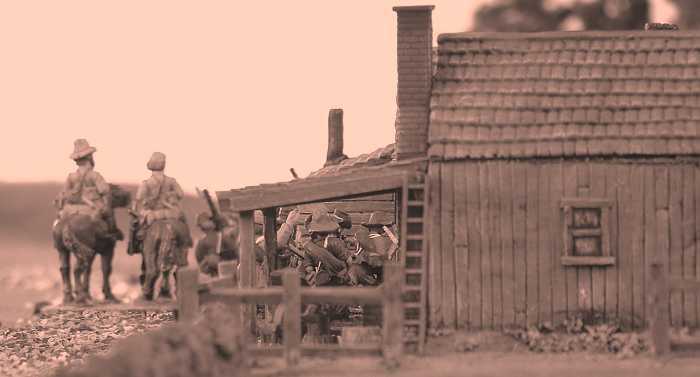 As this battle was a small part of a larger affair, the armies were deployed very close – in some cases infantry regiments were already in long musket range of the enemy. Above: Approximate positions an hour after hostilities commenced. Note that what appears to be an odd mixed cavalry/infantry formation in the right foreground is actually two cavalry units in the process of passing through the lines of an infantry battalion. The Allied army consisted of Greg’s Russians and Peter’s Austrians and Prussians. 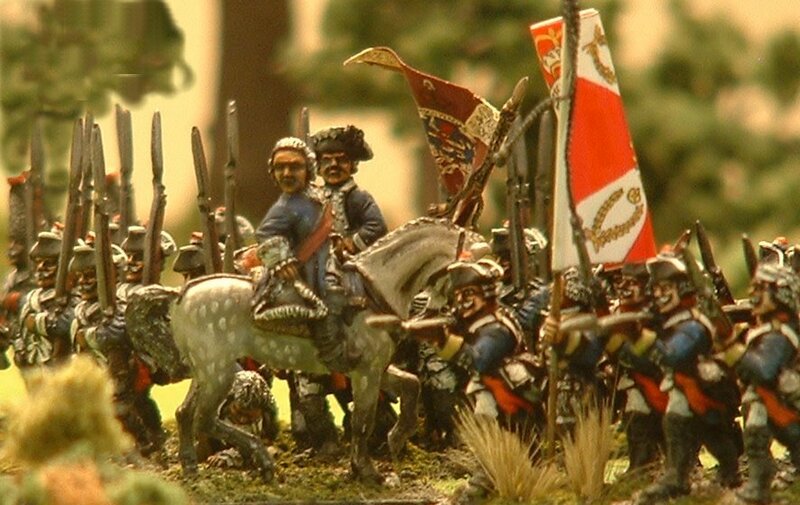 The French army consisted of everything I had painted, so was a bit of a grab bag of units that included two Italian, two Swiss and a Bavarian battalion. It was supported by a strong relief force of Fusilier-General Roly’s French, but the story of that command will be told later in this article. 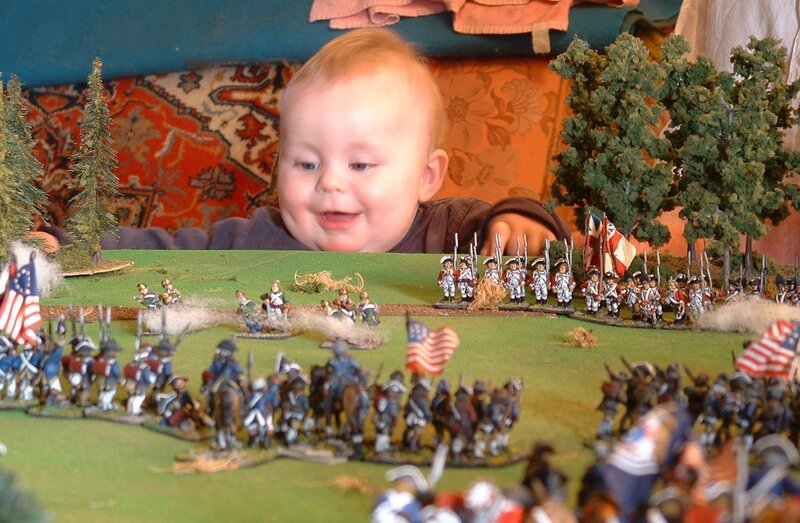 Unfortunately, all our armies are uniformed for the later Napoleonic Wars, but we did not let that get in the way. Not only were they wearing these later uniforms, but we also rated them for the later Napoleonic Wars. We were therefore using 1813 armies to fight the Austerlitz situation. 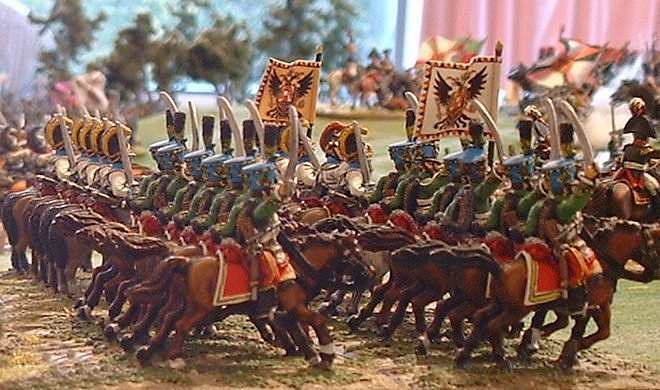 Above: Russian general staff direct their formidable infantry forces forward. 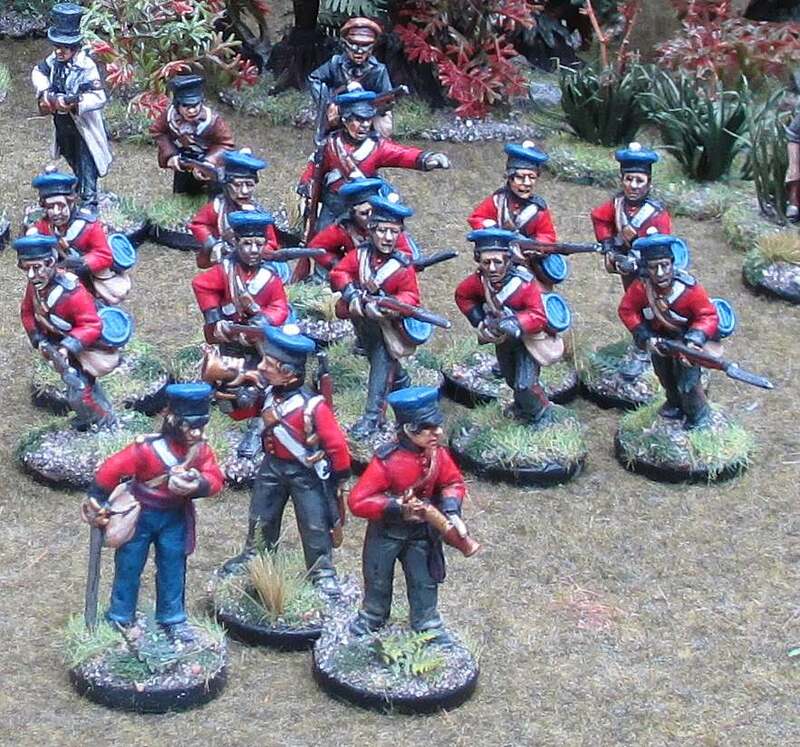 Greg’s Russians are Foundry and Front Rank figures, many with head-swaps and changed poses. The rules were Command Piquet which have already been reviewed on this site. Both Shane and I had played Piquet once or twice before, but never this variant. Greg and Peter managed to keep us on the straight and narrow. The battle started with an immediate Austrian attack on the small village that anchored the French right flank. This position of honour was held by a crack brigade of Swiss with a battalion of Bavarians and a small Bavarian battery in support. Their mission was to hold until reinforcements arrived. For the entire duration of the battle the Austrians tried to break into the village and to cut it off from the French centre but were repeatedly repulsed. 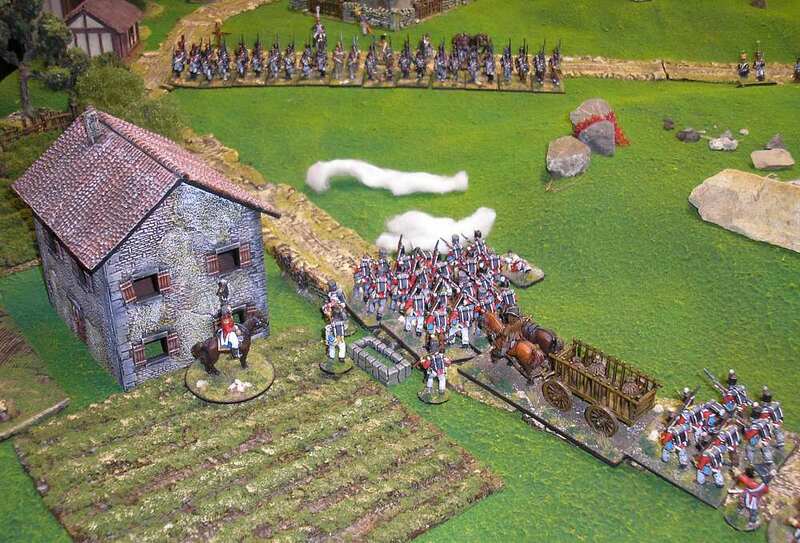 Above: The Prussians and Austrians march forward, supported by artillery. These are Peter’s Calpe and Front Rank figures with GMB Design flags. 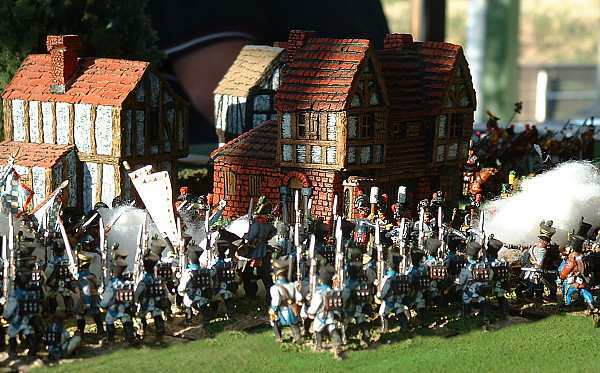 Above: Austrian infantry attack the village. Above: Austrian artillery bombards the defenders of the village with close range artillery fire. More of Peter’s Front Rank figures. In the centre, both sides battled for possession of the high plateau. 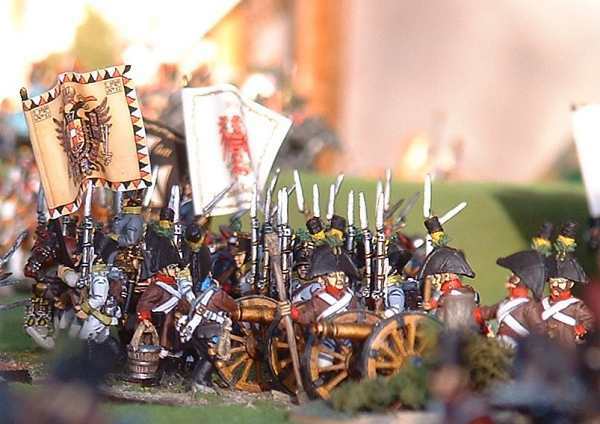 Massed Russian infantry attacked the French centre but were beaten off by the 12-pounders of the Imperial Guard and repeated charges by the Grenadiers-a-Cheval and Gendarmerie d’Elite. Meanwhile, the French reserves climbed the plateau and took possession of the flat ground overlooking the enemy centre. Above: Russian infantry advance to the attack. 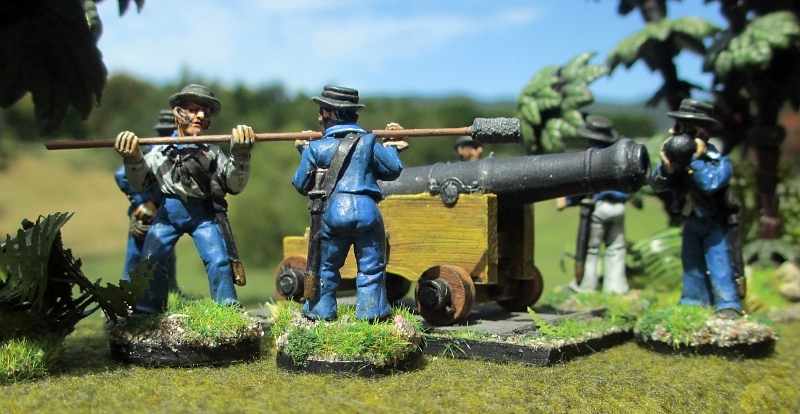 These are some of Greg’s Foundry figures, whilst the flags are by GMB Design. 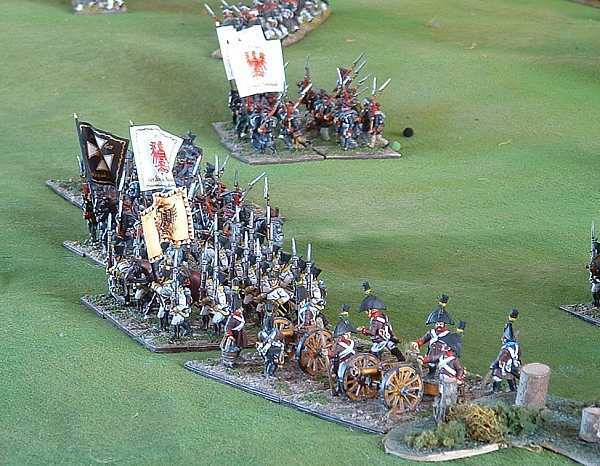 Above: Grenadiers-a-Cheval and Gendarmerie d’Elite throw back the Russian advance in the centre. Above: Italian infantry march forward to consolidate the gains in the centre. 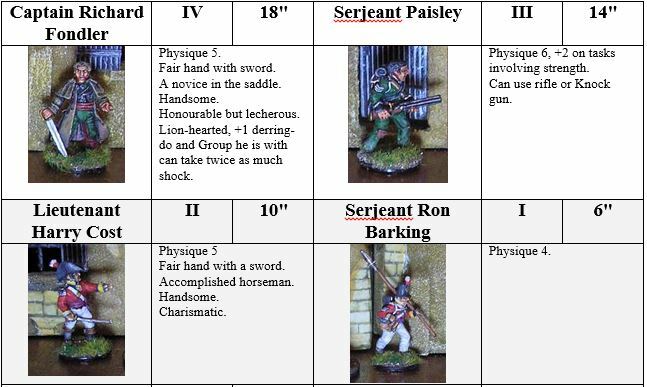 These are Brian’s figures, which consist of a mixture of makes, including Connoisseur, Front Rank and Hotspur. Above: French reserve divisions advance. 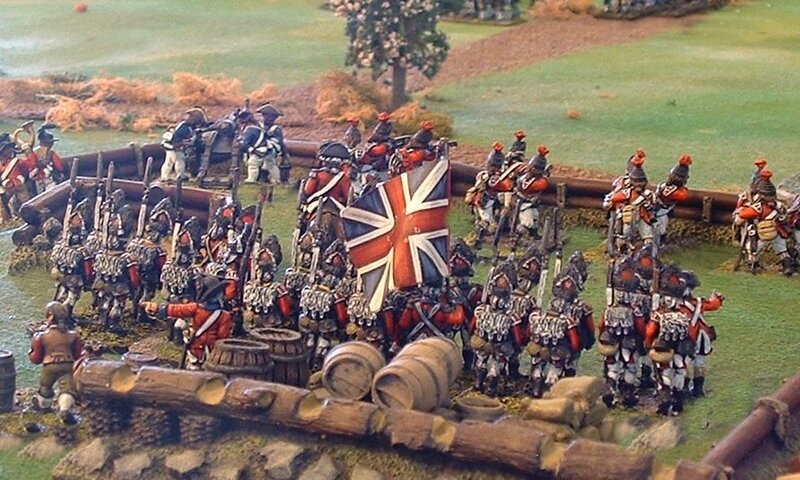 Again, these figures show the wonderful mixture of manufacturers in Brian’s French army. 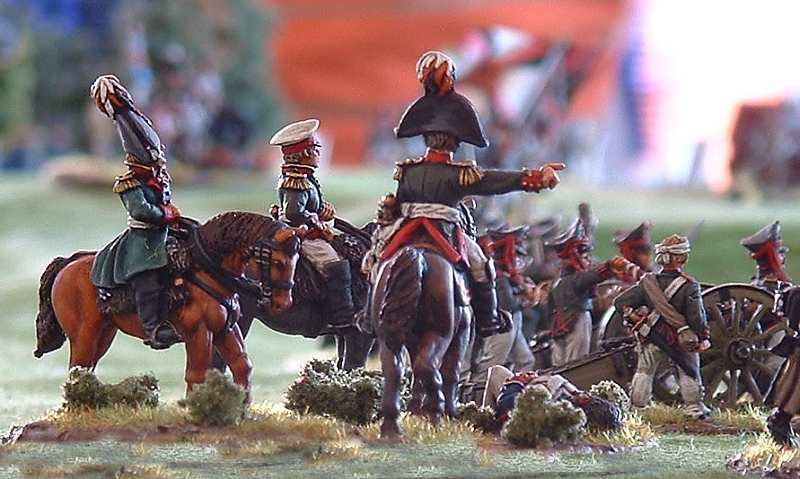 On the left, the French attacked with great élan but despite some initial success with their dragoons and lancers, were stalled when their cavalry brigades were repulsed by concentrated Russian artillery fire and Austrian cavalry charges. 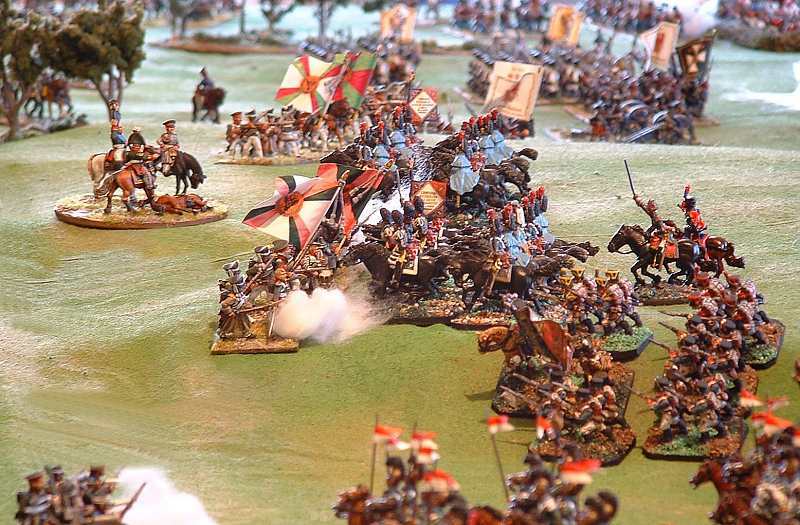 Above: French Lancers charge to force back advancing Russian infantry. 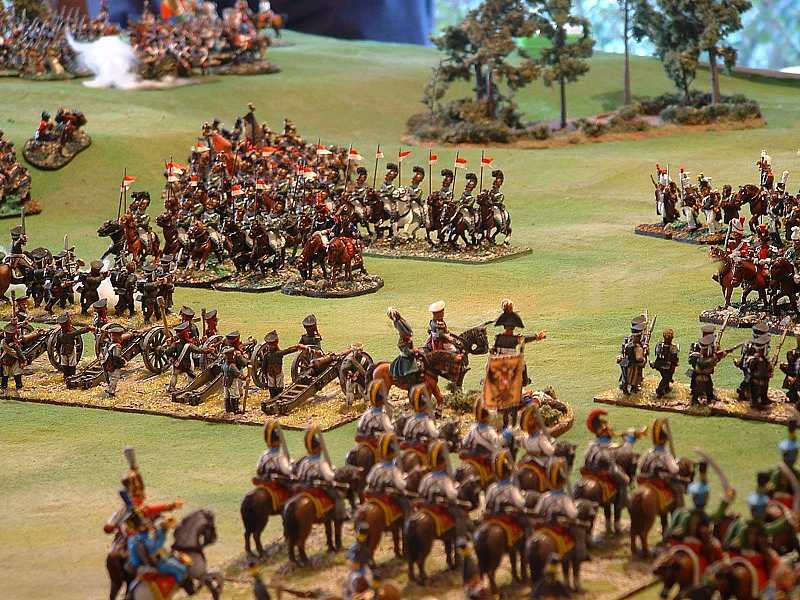 Above: But Russian artillery and Austrian cavalry are ready to repulse the French cavalry. On the extreme left flank only the heroic actions of the 1st Battalion of 15th Legere managed to salvage what was becoming a serious problem for the French. 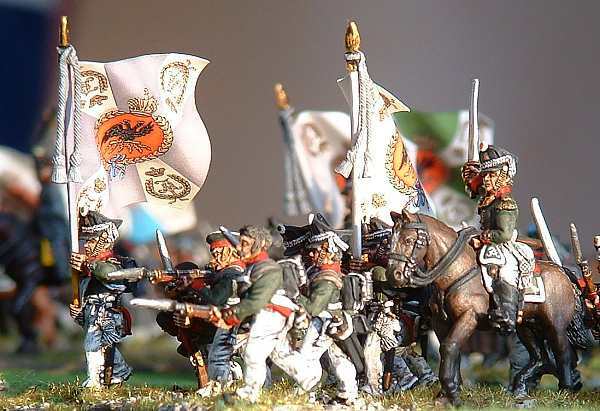 A brigade of Austrian Dragoons and Hussars had broken the French dragoons and sent them scuttling backwards, but the feisty 15th Leger drove off the Austrian cavalry brigade with several well aimed volleys. 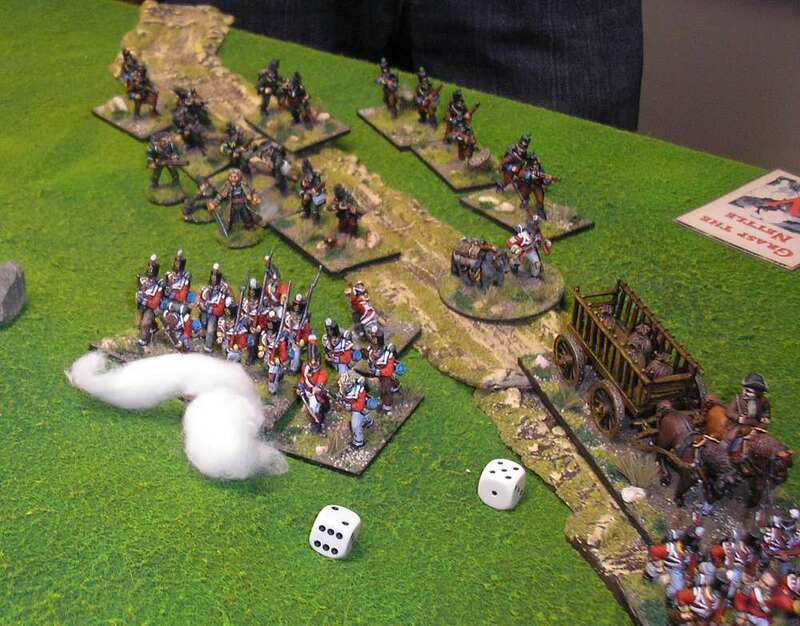 Above: Austrian cavalry ready themselves to charge the French dragoons, before being themselves being driven off by the fire of a French light infantry battalion. Front Rank figures. Late in the day the battle was going well for the French, or so it seemed. Their line was unbroken and they had possession of the high ground. The village was still in their hands and the serious position on the left flank had been stabilised. However, the repeated attacks had degraded the fighting capability of almost all brigades and looking across the field of battle the French commanders could see fresh divisions of uncommitted Russian troops and a huge cavalry reserve that had not yet entered the fray. 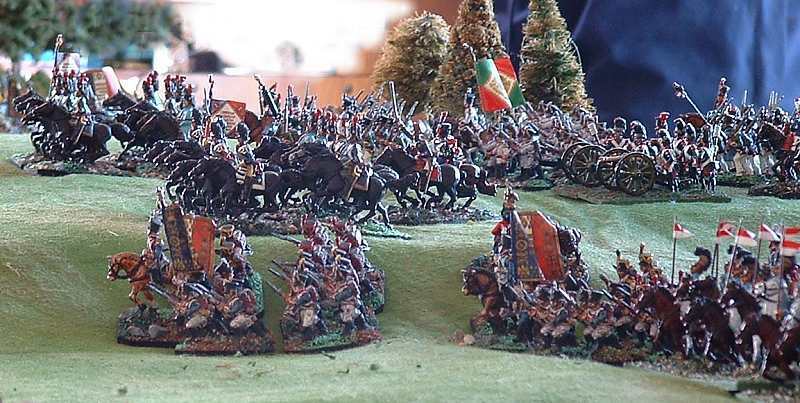 Above: The Russian cavalry reserve awaits orders to advance. The long hoped for French reserves had taken a wrong turn and in a prelude to the terrible events of 1815, had not marched to the sounds of the guns. We played about five or so hours at a fairly leisurely pace. I can only talk for myself of course, but I quite like the Command Piquet rules in that they give a fun game with a lot of surprises. What I don’t like about them is the all-or-nothing nature of combat. Shooting/Melee either does huge damage or virtually none. Still, you take what you can get, aye? Above: Fusilers Shane Saunders and Brian Smaller (French), Greg Simmonds and Peter Haldezos (Allied) holding a mascot in between them. 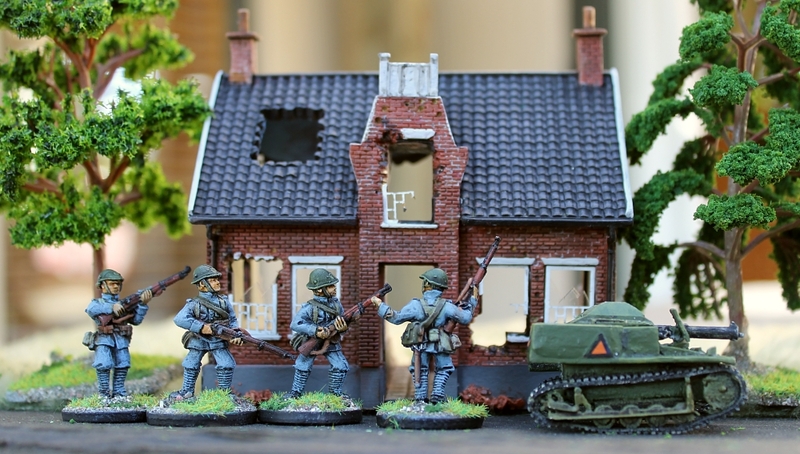 Not in this photo are Fusiliers Paul Crouch (who took these superb pictures), and Roly Hermans (who failed to bring his French reinforcements to the game, but who designed this web-page). 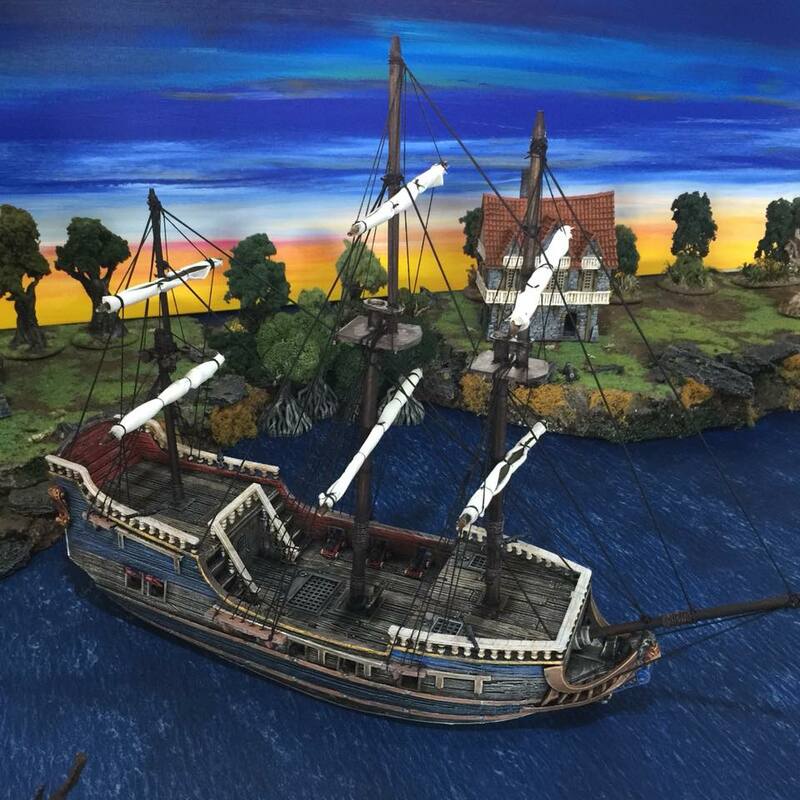 PS: For the eagle-eyes, here’s a challenge – in one of the above photos, can you find the Seven Years War figure that had to be pressed into service for our game? !